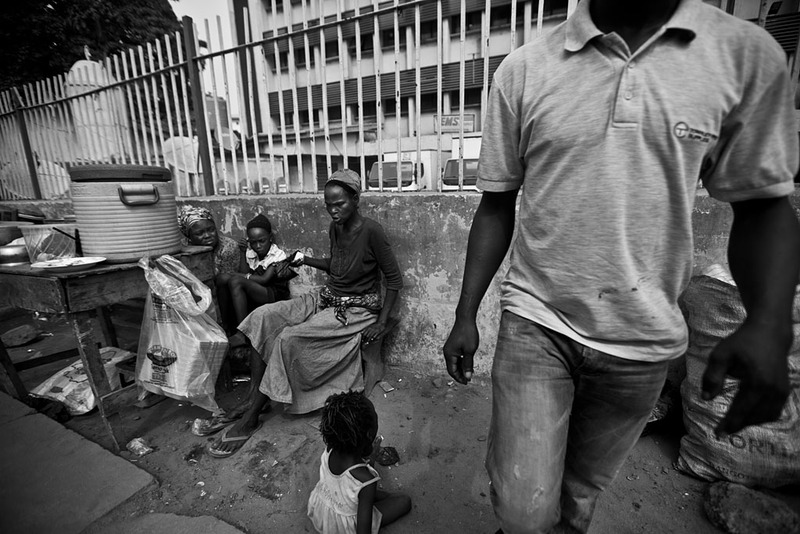 My trip to West Africa, visiting Nigeria, The Gambia, Senegal, Guinea-Bissau, Guinea, Sierra Leone and Liberia. 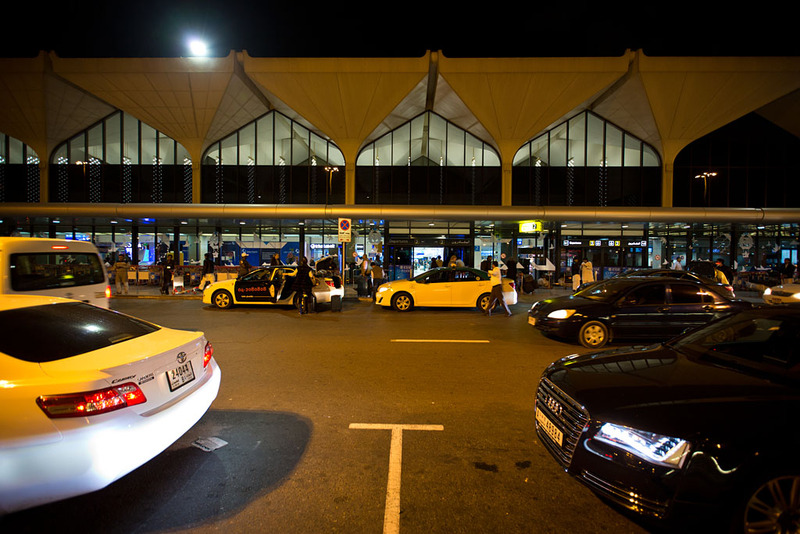 Outside Dubai Airport at 2am, ready to check in for my 4:30am flight to Lagos (LOS) via Addis Ababa (ADD). 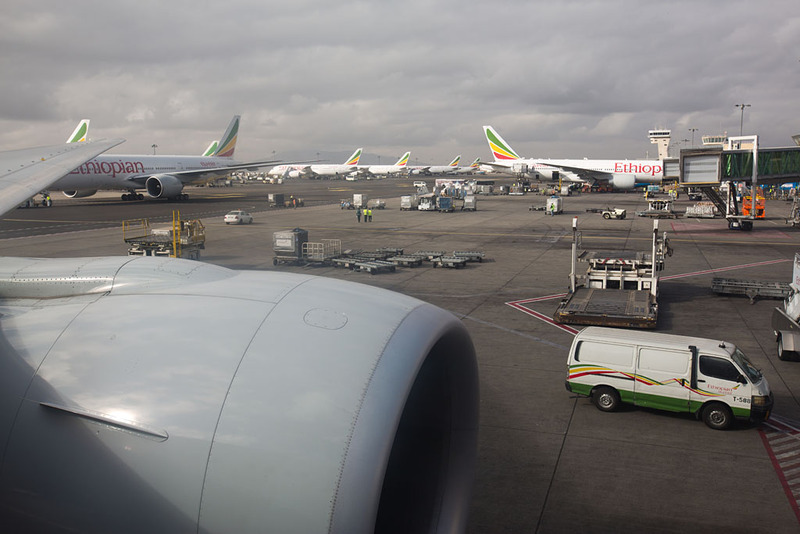 Day 1: Flying Ethiopian Ailines (ET) from Dubai to Lagos via Addis Ababa (DXB-ADD-LOS). 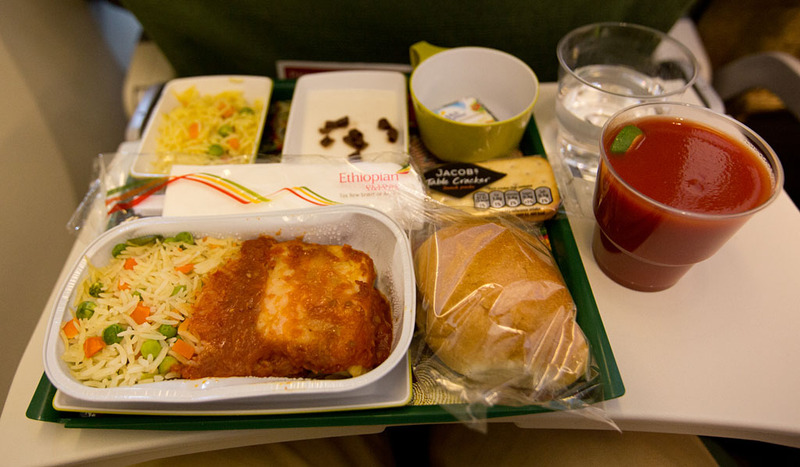 Day 3: Flying Arik Air (W3) from Lagos to Banjul (LOS-BJL). 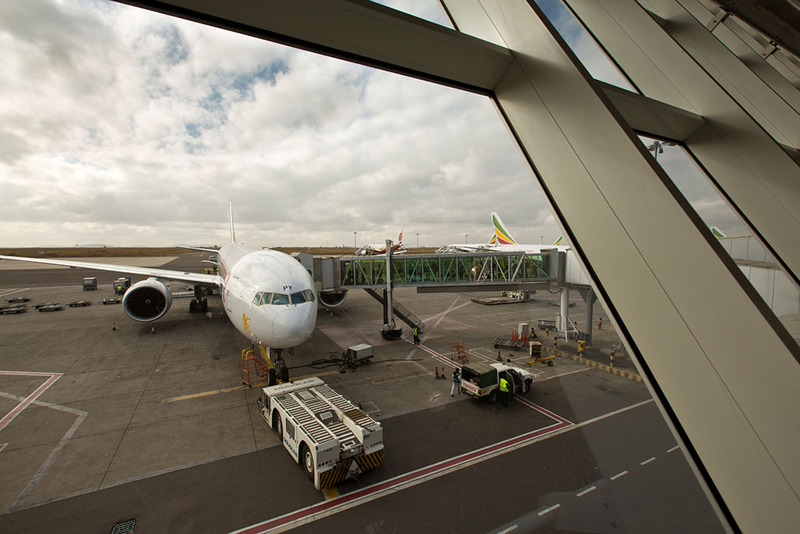 Day 9: Flying ASKY Airlines (KP) from Bissau to Dakar (OXB-DKR). 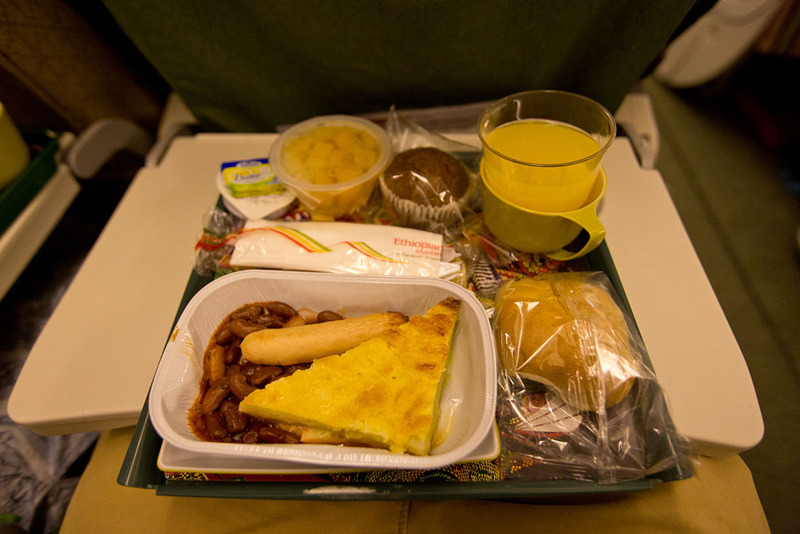 Day 11: Flying ASKY Airlines (KP) from Dakar to Conakry (DKR-CKY). 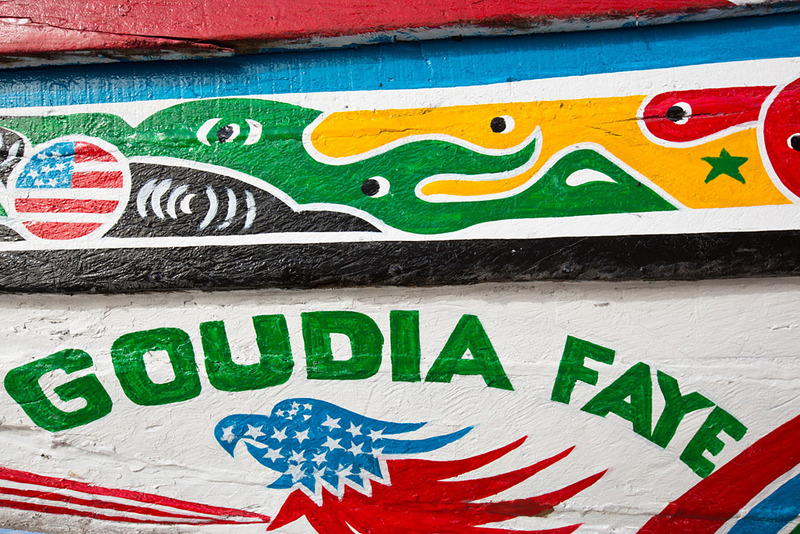 Day 14: Flying Air Côte d'Ivoire (HF) from Freetown to Monrovia (FNA-ROB). 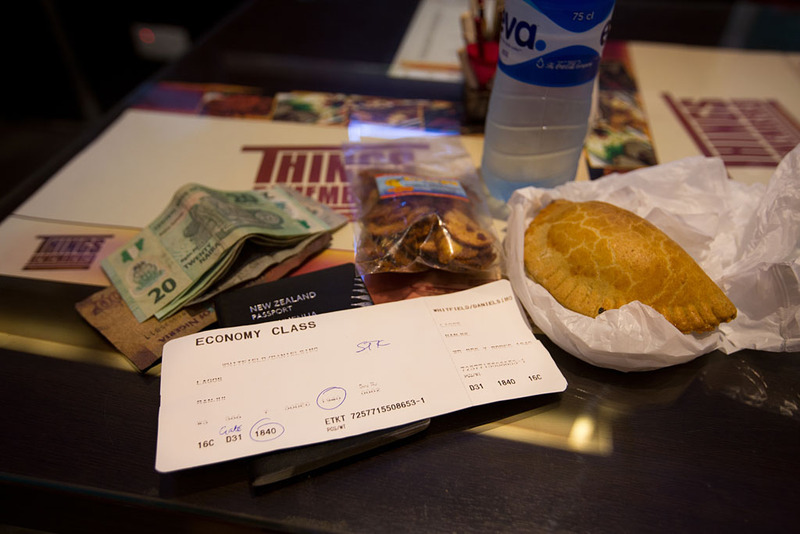 Day 16: Flying Air Maroc (AT) from Monrovia to Casablanca (ROB-CMN). 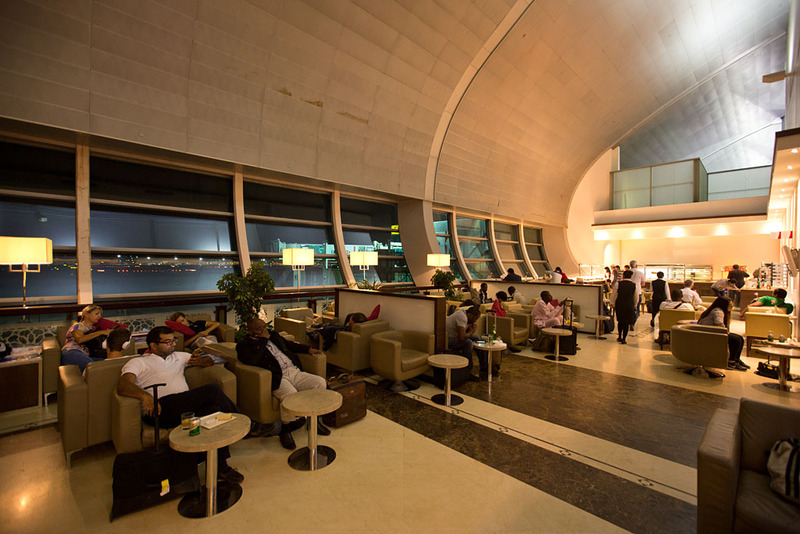 Day 17: Flying Emirates (EK) from Casablanca to Dubai (CMN-DXB). And a close up of my intra West Africa flights. 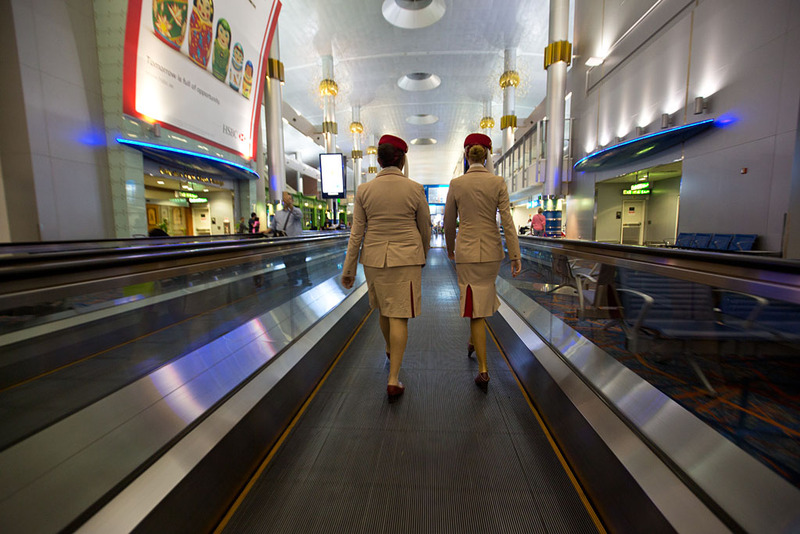 A couple of Emirates ladies on the travelator air-side in Terminal 1. 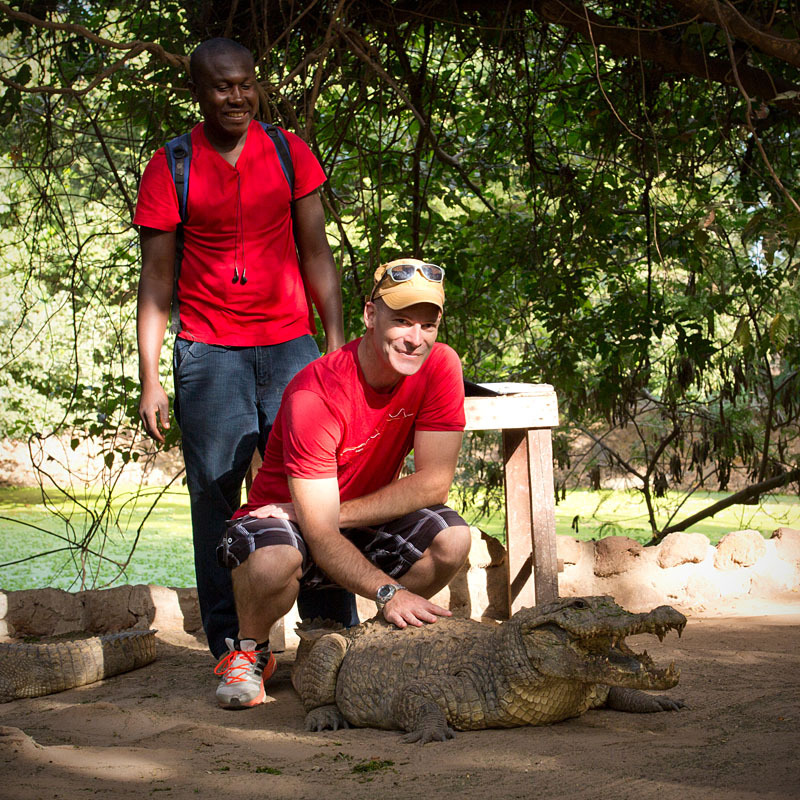 When I heard my friends Jason and Jordan were heading to West Africa I couldn't resist joining them to a not often visited part of the world. 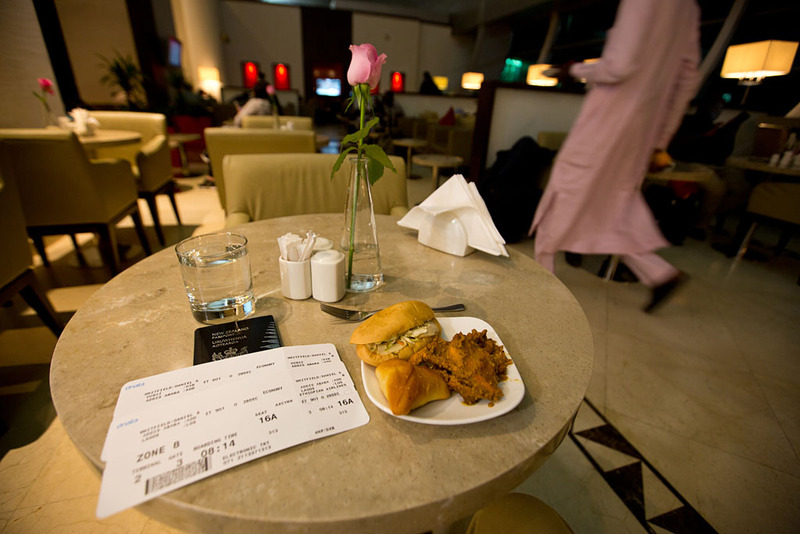 At the Marhaba Terminal 1 lounge getting a snack. Entry to the lounge was complimentary with my HSBC credit card, and was a nice place to rest up before my early morning flight to Addis Ababa. When planning how to meet up with Jason and Jordan in Banjul for the trip, my main options were to either fly via Barcelona or Lagos. 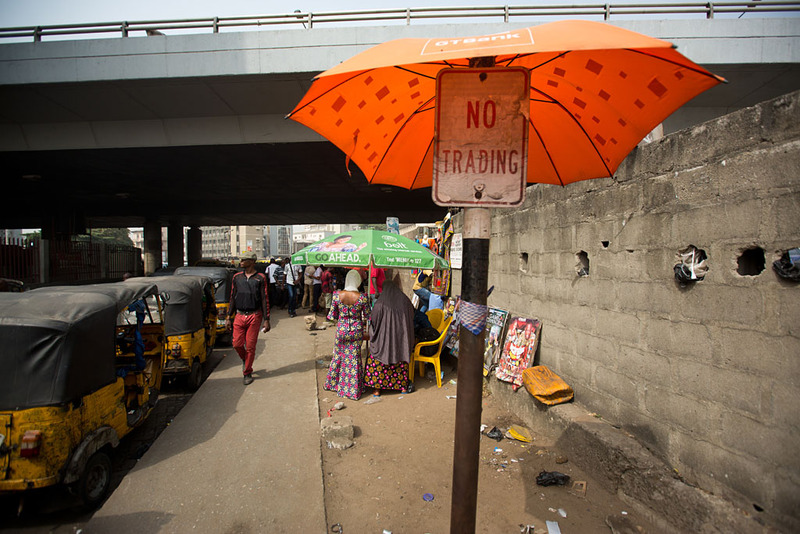 As I have never been to Nigeria before, Lagos quickly won out as the preferred option. Take-off from Dubai was on time and we were served a decent breakfast soon after. 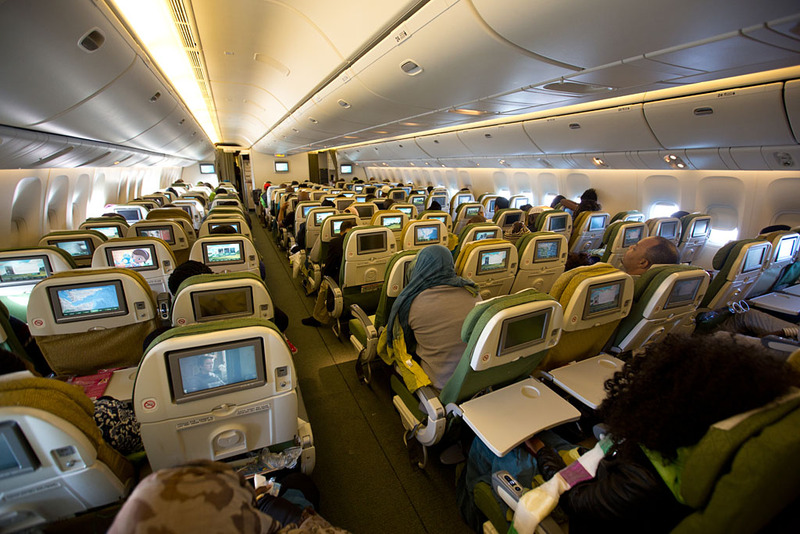 Ethiopian Airlines still have nine across (3-3-3) seating in their Boeing 777's, which seems to becoming increasing rare these days with most airlines now having ten seats across in economy (3-4-3). 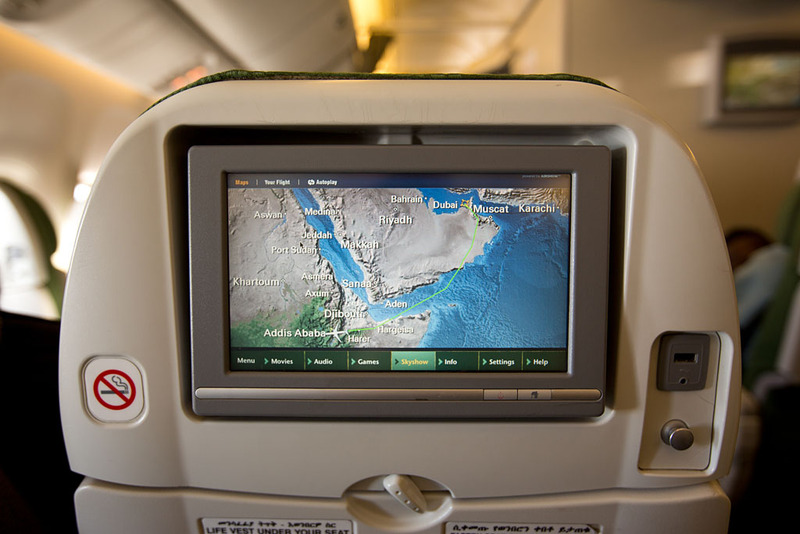 The flight initally headed south-east over Oman and then down the Gulf of Aden, totally avoiding Yemeni and Saudi airspace due to the ongoing Saudi Arabian-led intervention in Yemen. 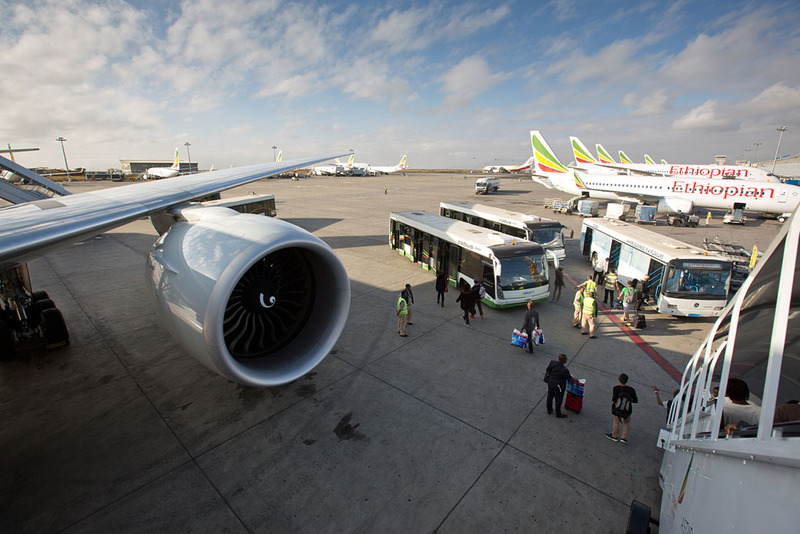 Arriving at Addis Ababa Bole International Airport (ADD), the main hub for Ethiopian Airlines (ET) at 7:30am. 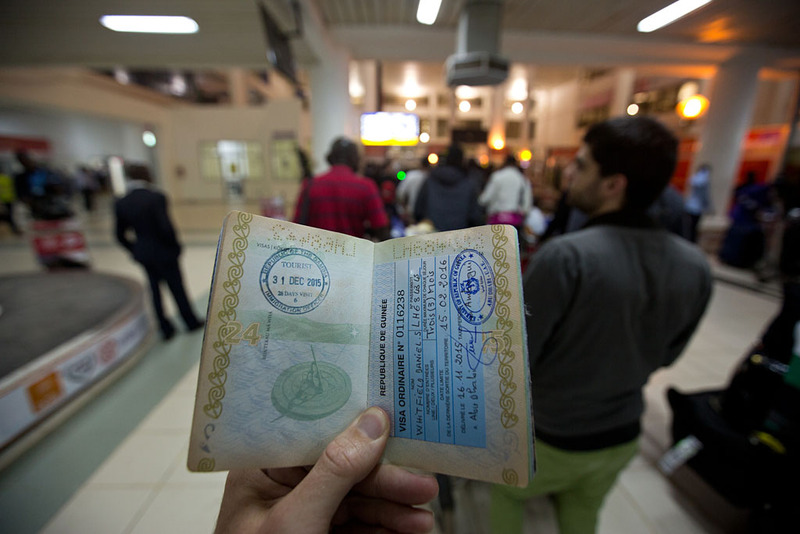 My last time at the airport was nine months ago when I was returning from my last trip to Africa. Our 777 for the connecting flight to Lagos (LOS). 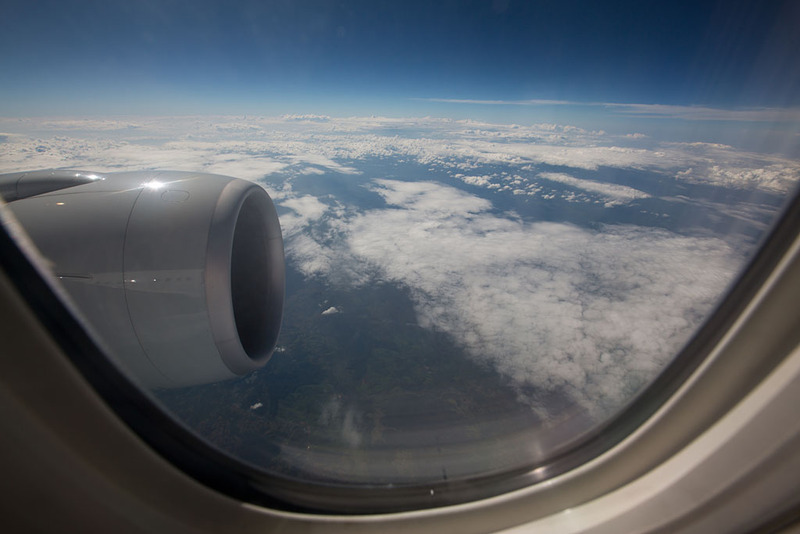 A row of new ET Boeing 787's in the distance from my window seat. 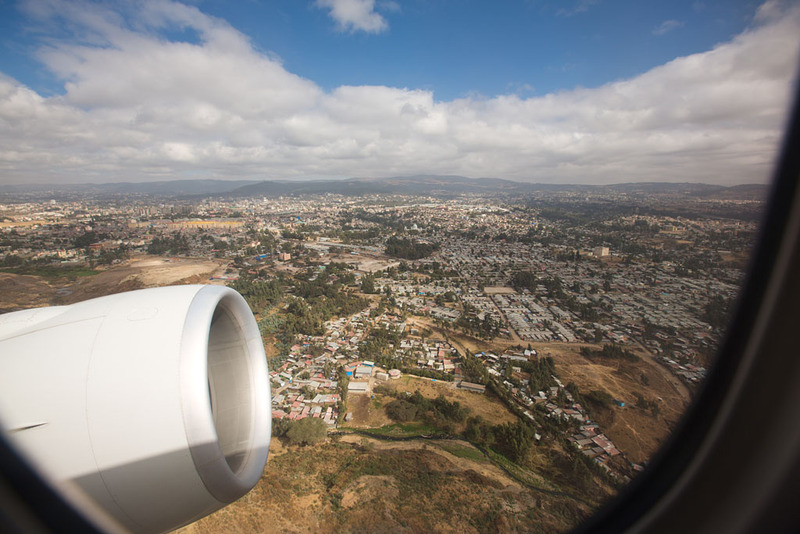 Climbing out over Addis Ababa soon after take-off. 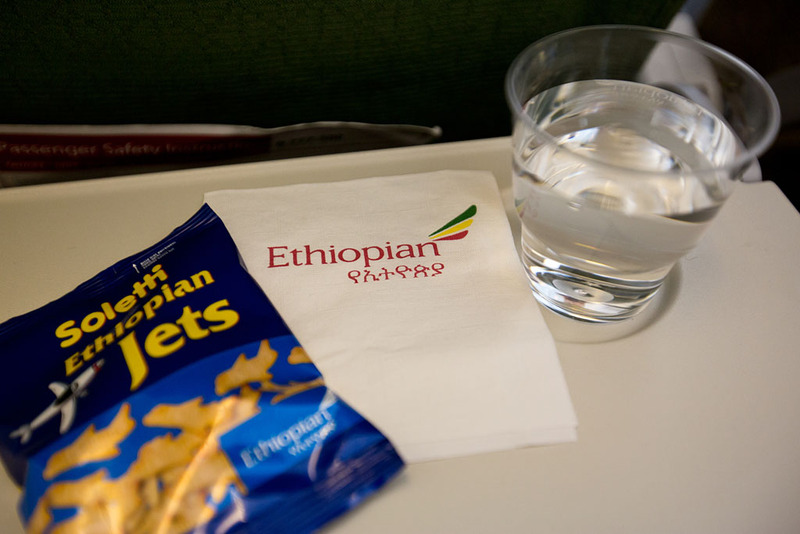 Some Ethiopian Jetplane snacks and water that were soon served. 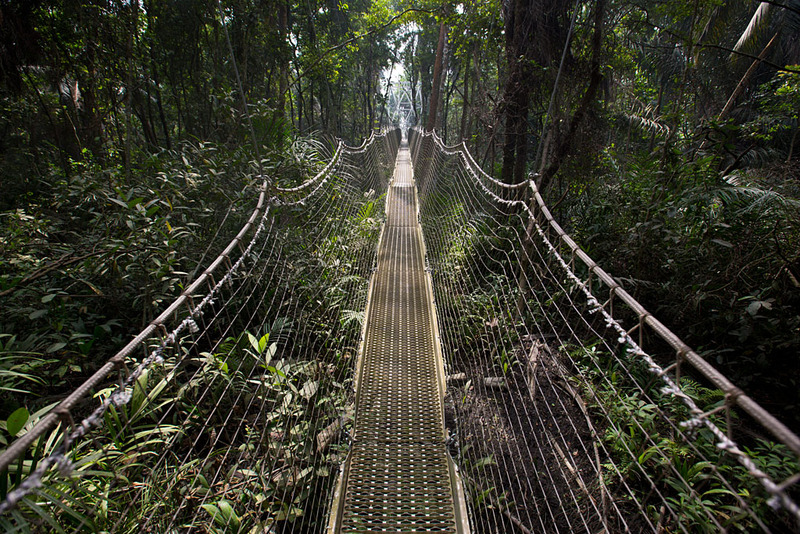 High above the dense jungle of the Central African Republic. Lunch of fish and rice. 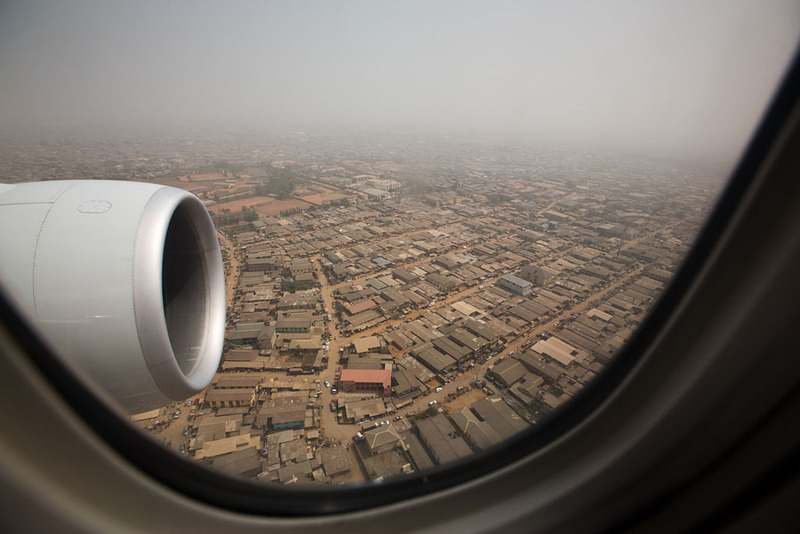 And on descent over Lagos. Soon after we taxied off the runway, people were up and out of their seats and getting their bags despite alot of shouting and protests from the flight attendants. 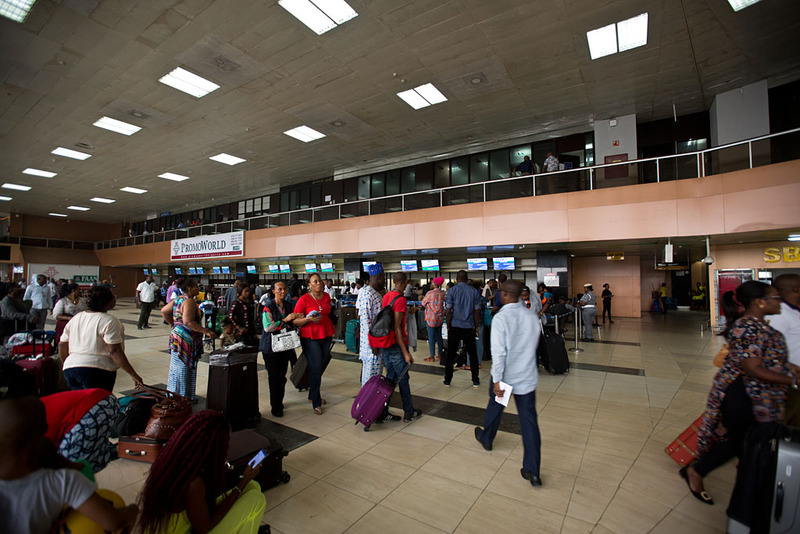 All aircraft have to be towed up to the gate at Murtala Muhammed International Airport so there was a few minutes delay before we were able to disembark. After hearing frequent stories of hassle and corruption at the airport, I fortunately had no issues at all. 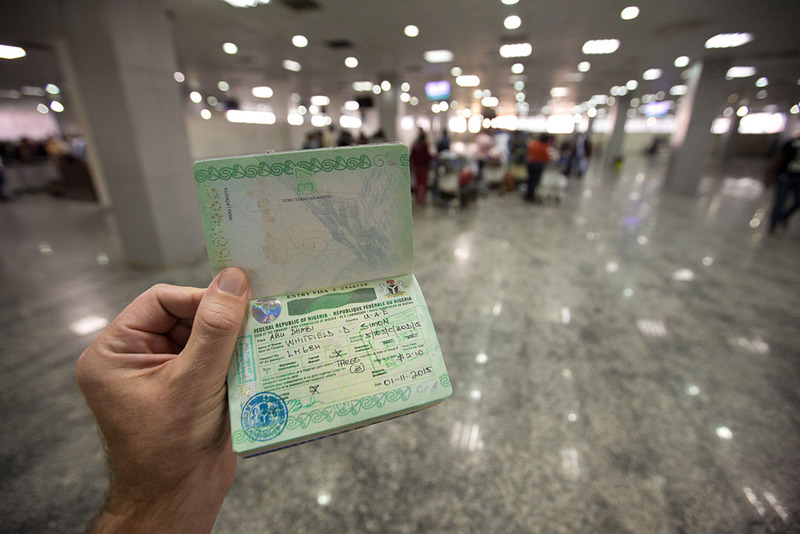 I did get my passport checked 3-4 times though as well as my yellow fever vaccination, and a policeman asked me why I was taking photo's but he seemed to be appeased when I showed him it was just of my stamped passport. 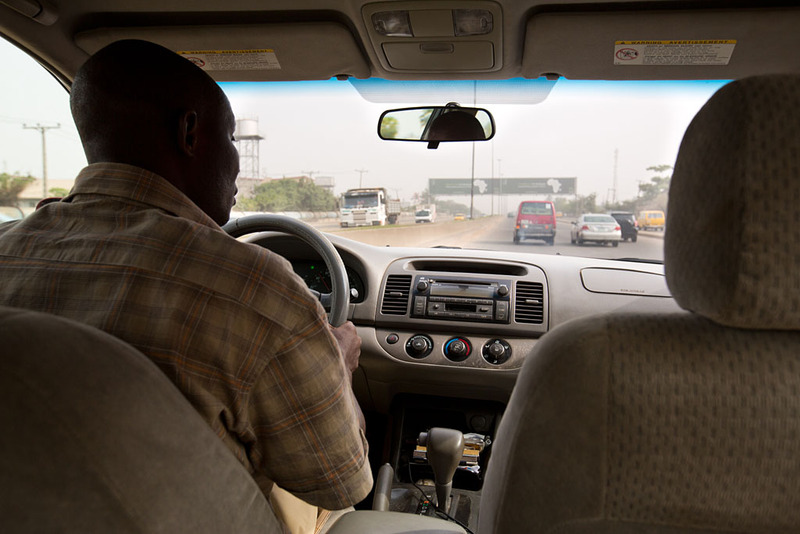 I then met up with my driver I had organised, Ajiboye, for the drive to Lagos Island to my hotel. 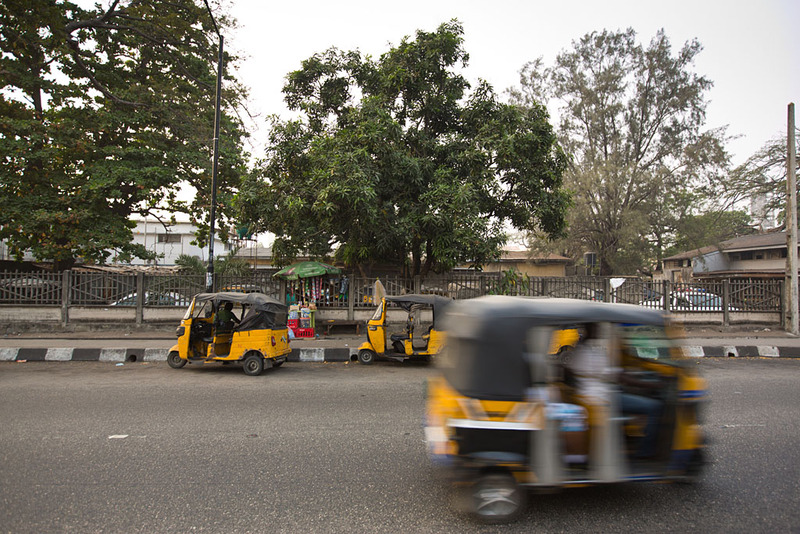 Luckily it was a public holiday in Nigeria so traffic was relatively light and the ~10 kilometre drive took about half an hour. 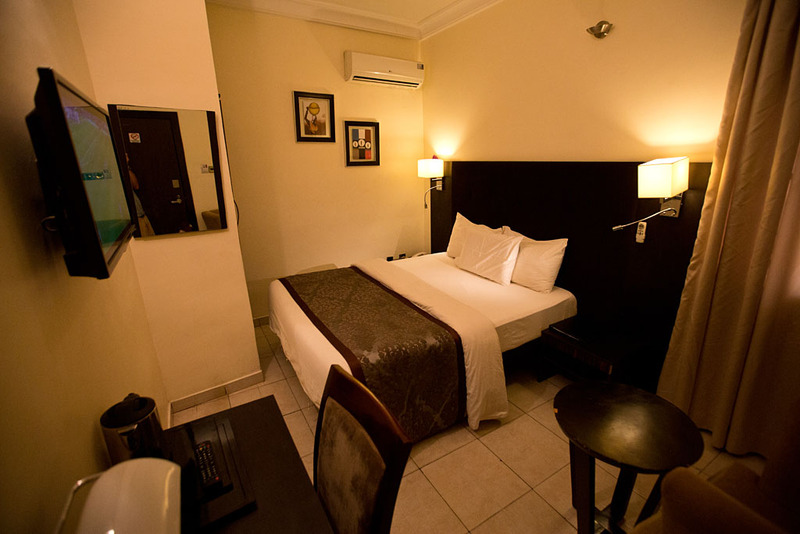 At my hotel on Lagos Island, Lakeem Suites Ikoyi. $100 a night with decent AC and wifi. I then went for an mid-afternoon stroll. The Syrian Mosque. The weather was quite warm and humid with the sun trying to peak through the haze and dust. 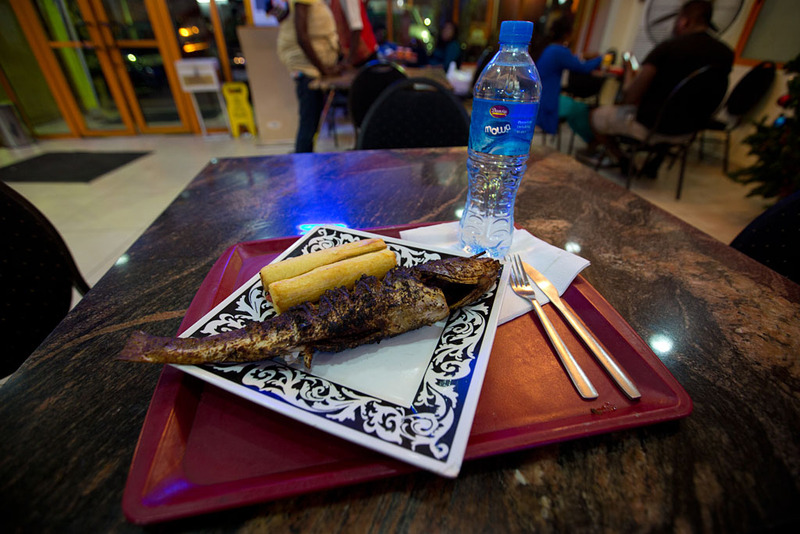 Stopping for some water and a sausage roll for 150 Naira (~75 cents). Mother & Son. 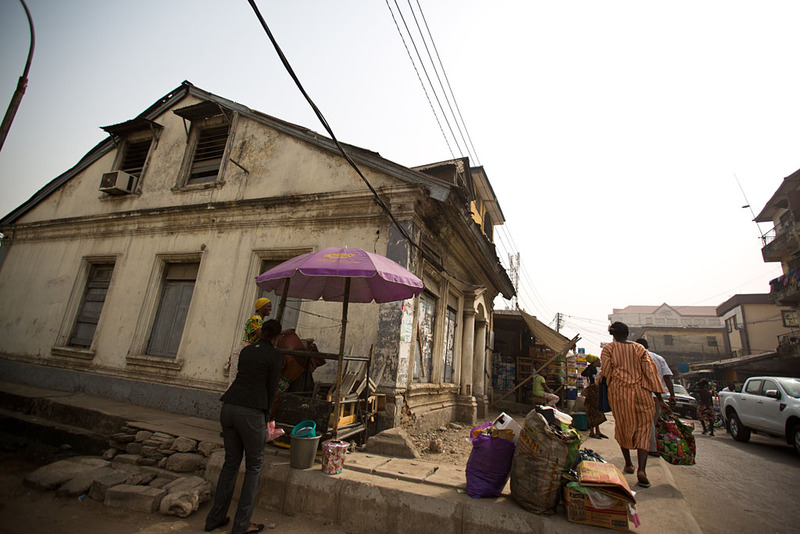 Lagos Island was originally home to the fishing village of Eko and eventually grew into the modern city of Lagos. 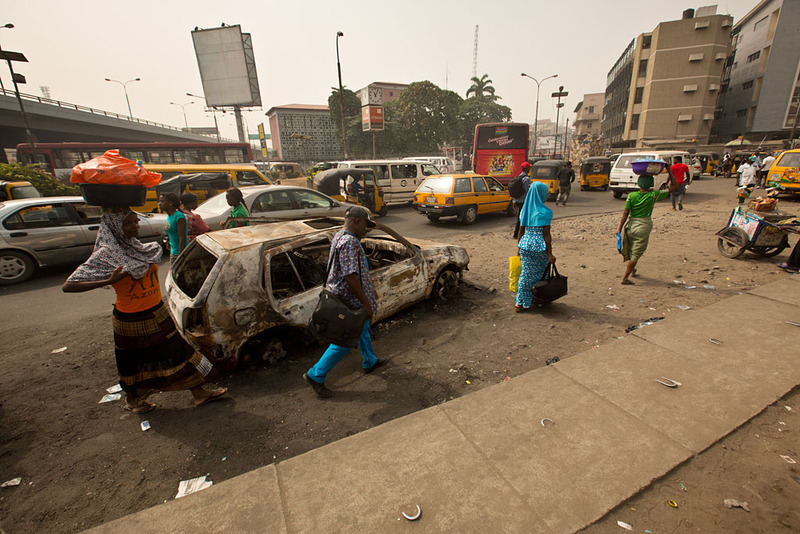 Lagos has now spread out to the neighbouring islands as well as the mainland. 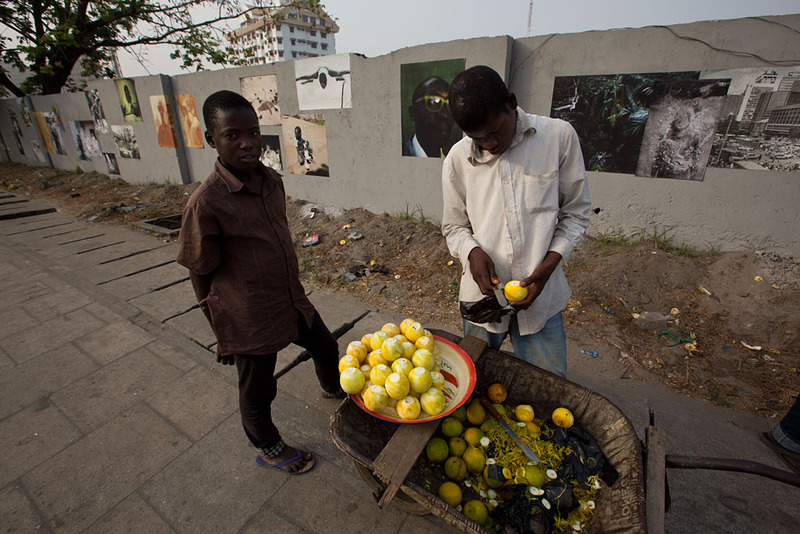 Getting a couple of oranges for 30 naira (~15 cents). 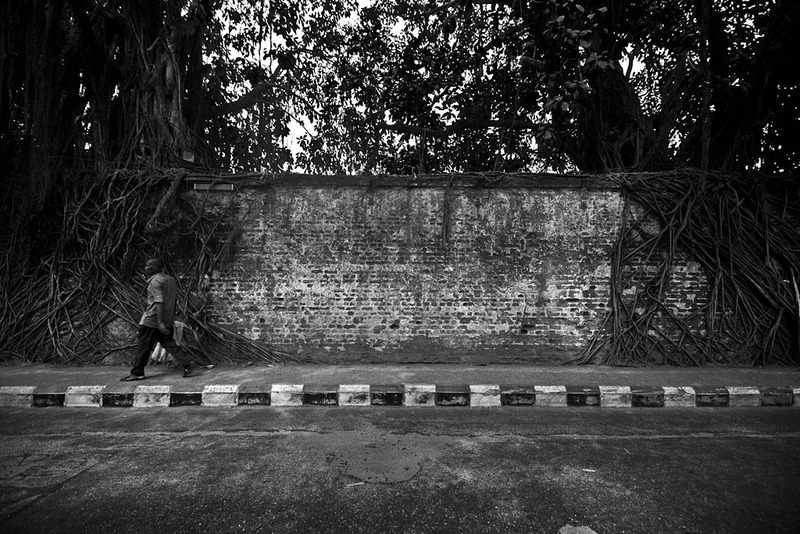 The wall behind was covered in some very interesting photo's and definitely not your usual urban graffiti and postings. 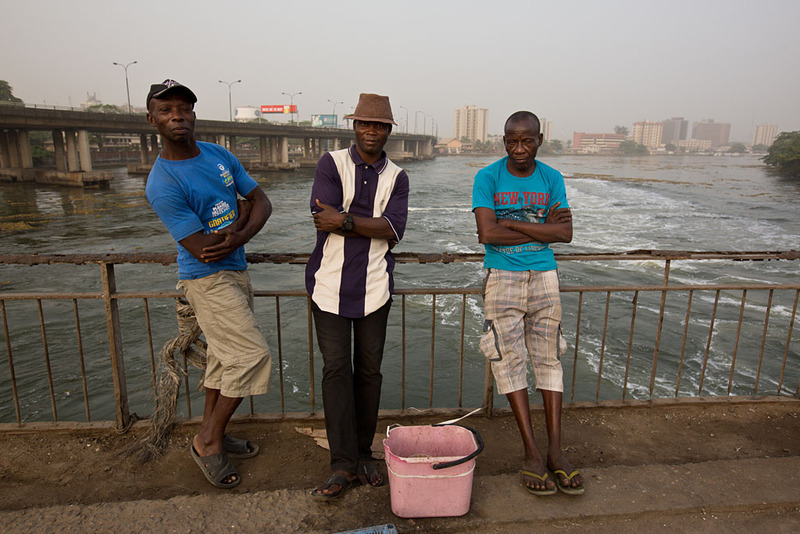 I would later learn that they were part of LagosPhoto, an international arts festival begun in 2010. Under the bridge. 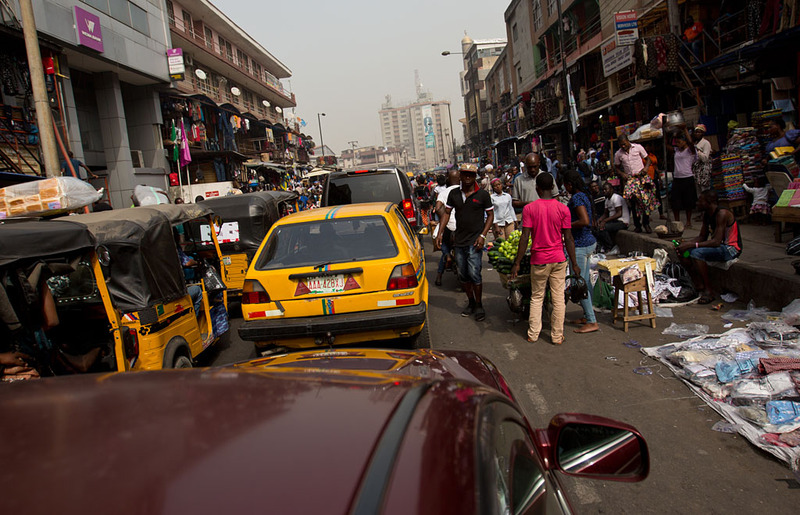 Lagos is the biggest city in Africa with an estimated population of over 21 million. Some friendly locals who didn't mind posing for a photo. 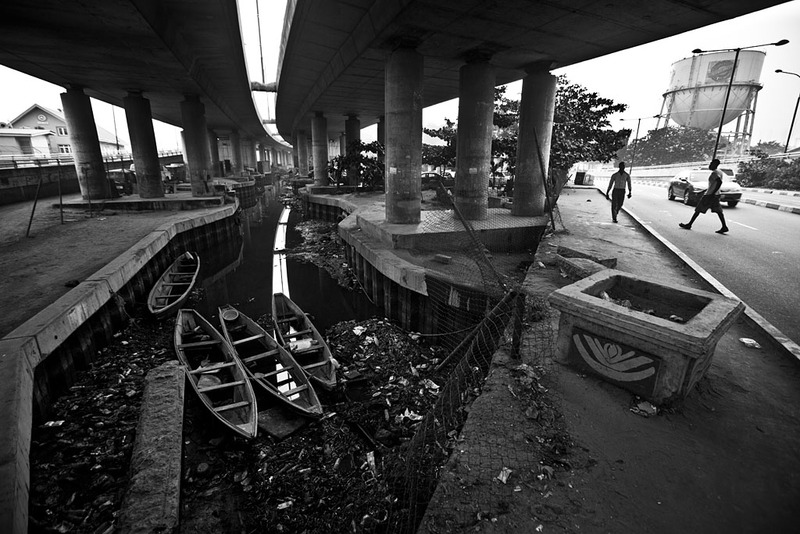 Just on the bridge between Lagos Island and Victoria Island. 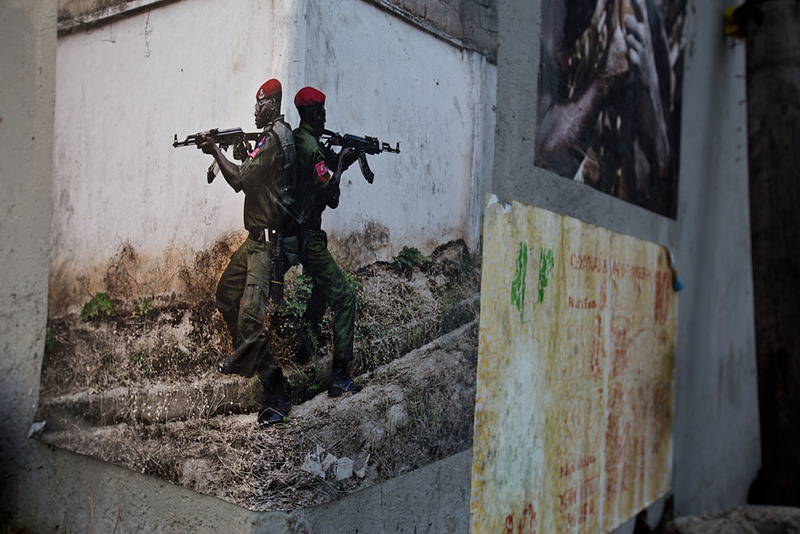 On my way back I checked out the LagosPhoto wall again. 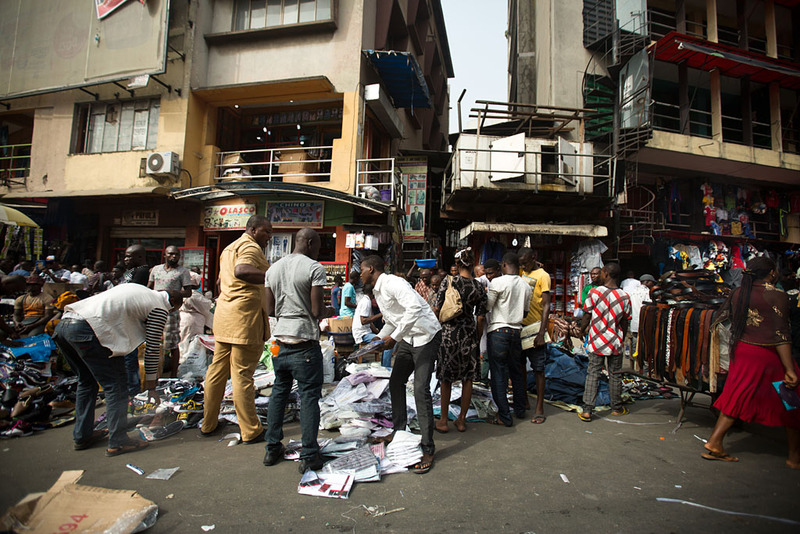 Before the trip I was abit apprehensive about walking the streets of Lagos, but I had no problems and it seemed quite reasonably safe. 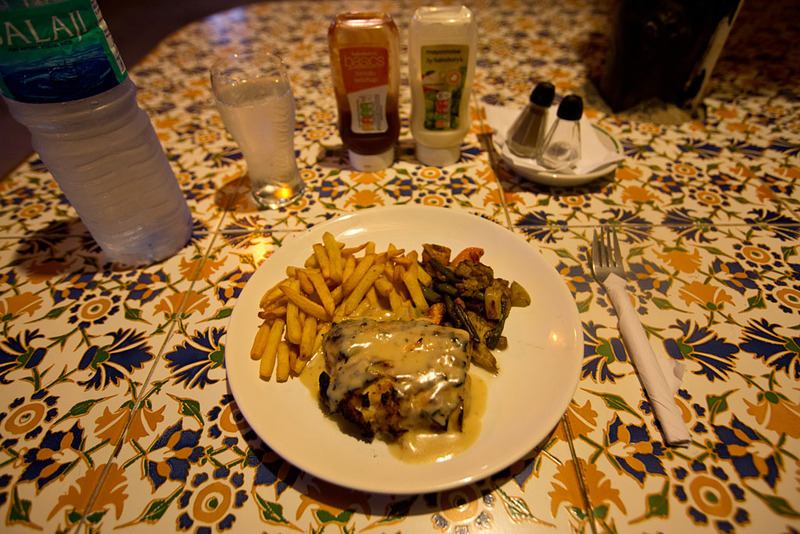 For dinner I went to a local restaurant and had some tasty local fish before retiring to the hotel after an interesting first day of the trip. 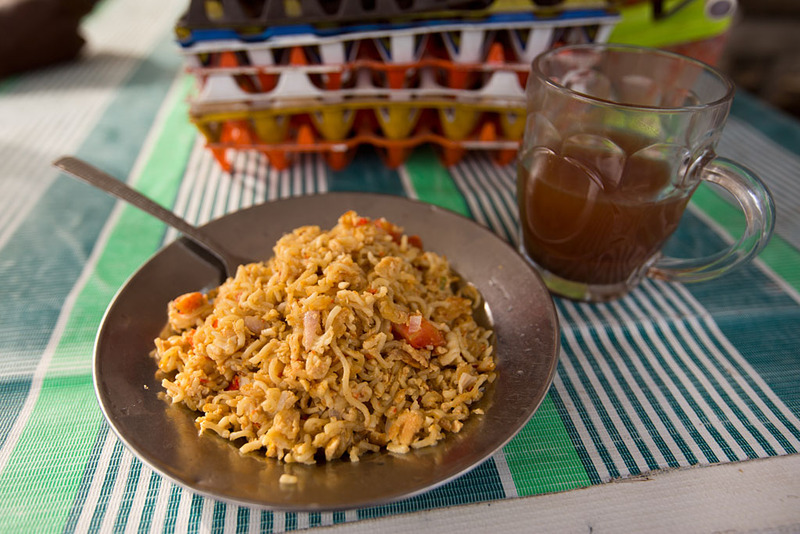 For breakfast my hotel didn't have a restaurant so I went out to a street side stall where the locals were grabbing a bite to eat. 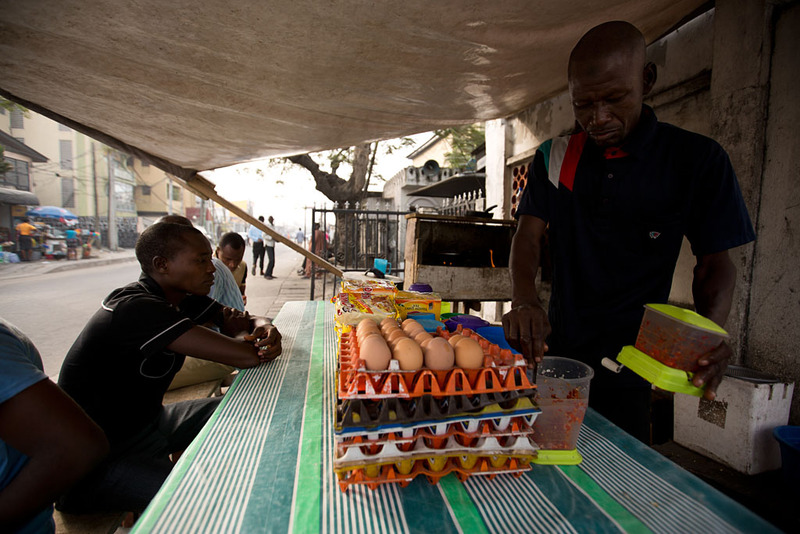 200 naira (~$1) for spicy noodles, eggs and a hot drink. Some kind of lottery/bingo/gambling shop on the corner. One of the guys rushed up yelling when I took the photo and demanded I delete the photo. I pushed a few random buttons on my camera to 'delete' it and seemed to calm down though. 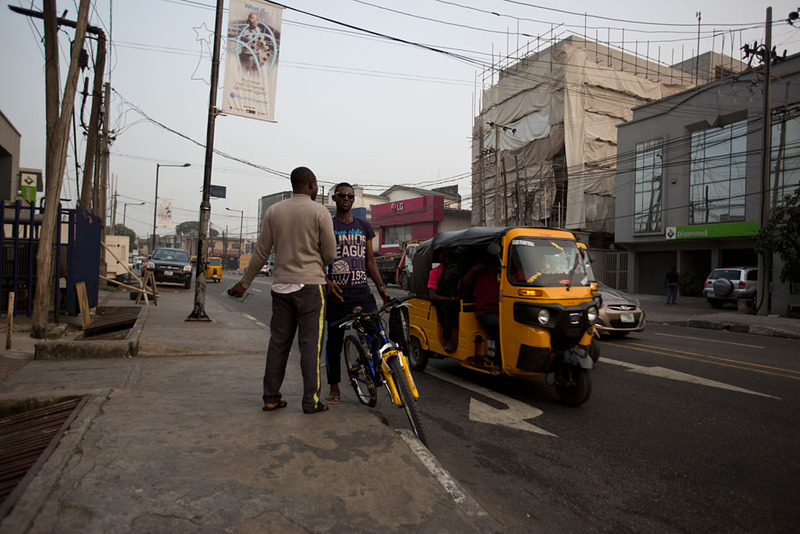 I then met up with my driver, Ajiboye, again to see some more of Lagos. 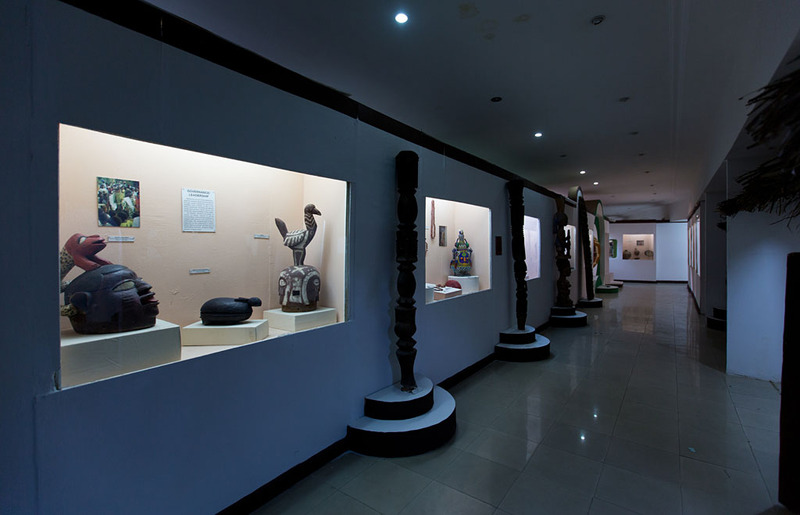 First stop, the National Museum. 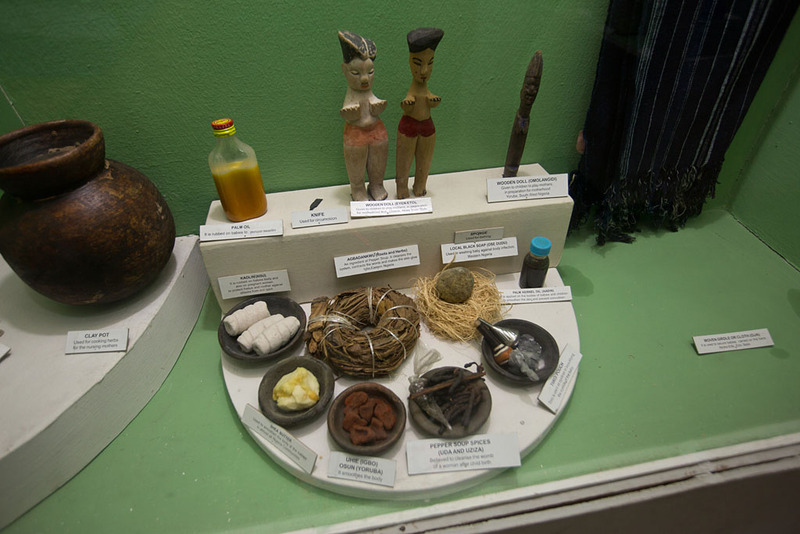 Various traditional herbs, spices and soaps etc. used during child birth. 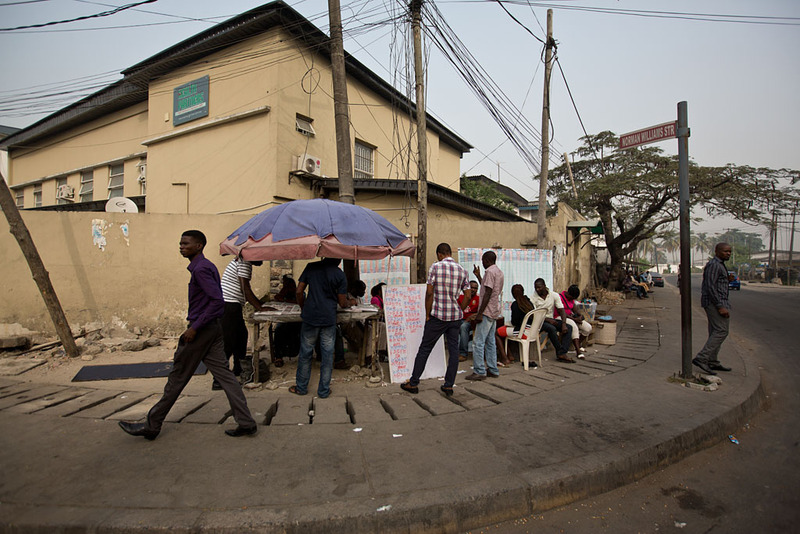 Nigeria has more than 500 ethnic groups, with varying languages and customs. 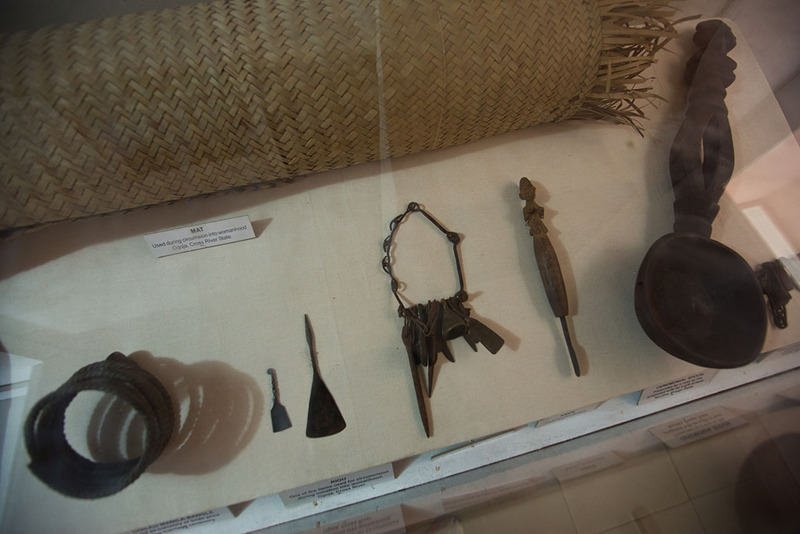 Tools used for traditional female circumsion (FGM). 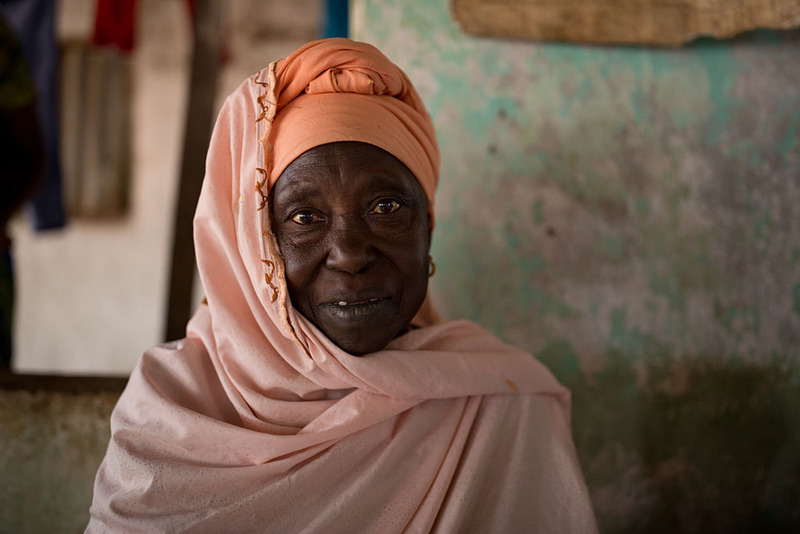 Nigeria has one of the highest rates of FGM and only officially banned it in 2015. When then went out to explore more of the city. A church in the old Portugese area. 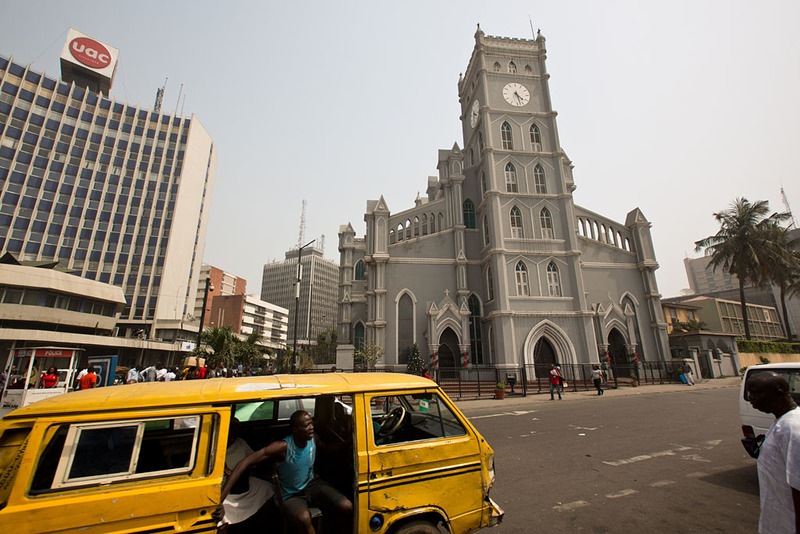 Lagos means "lakes" in Portuguese, the language of the first European-settlers known to visit the area. Some of the older colonial era buildings. 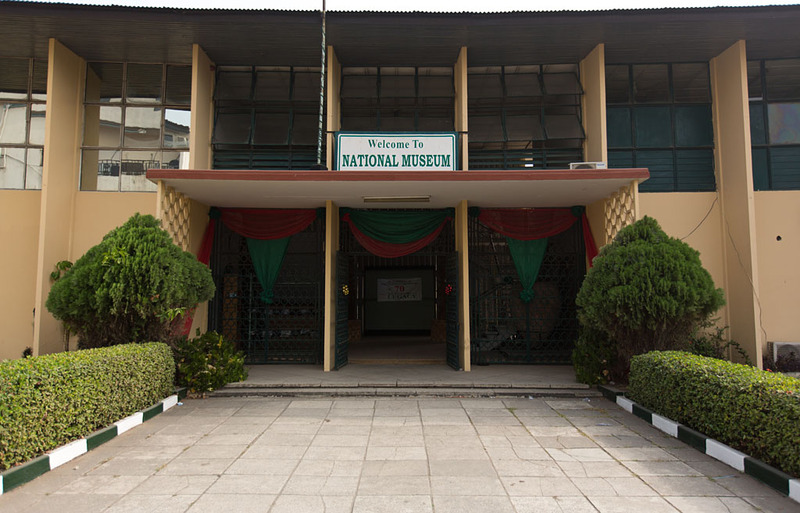 After being a British colony from 1800, Nigeria achieved independence in 1960. 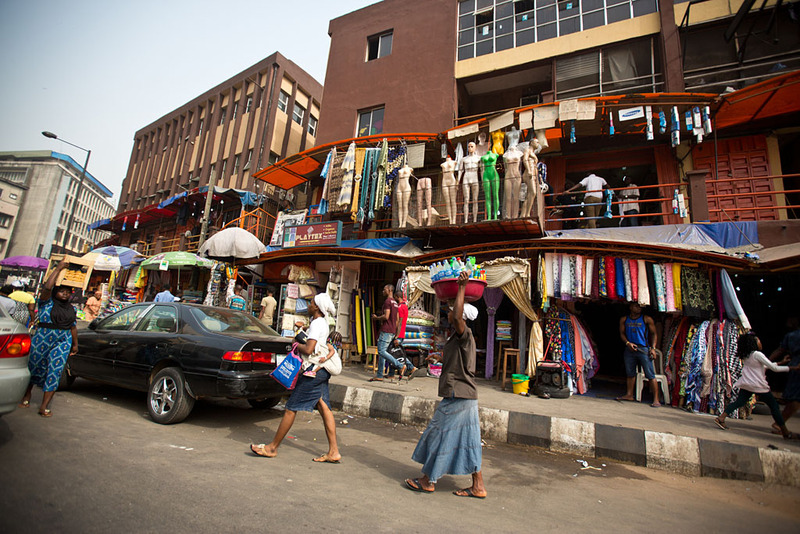 The vibrant colours and fabric at Balogun Market. A very busy and chaotic place! Edging slowly through the very crowded streets. 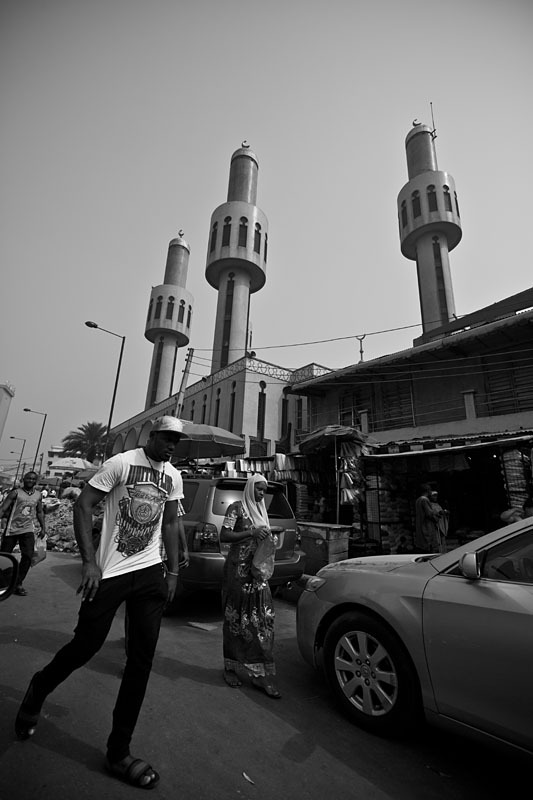 The minarets of the Central Mosque. 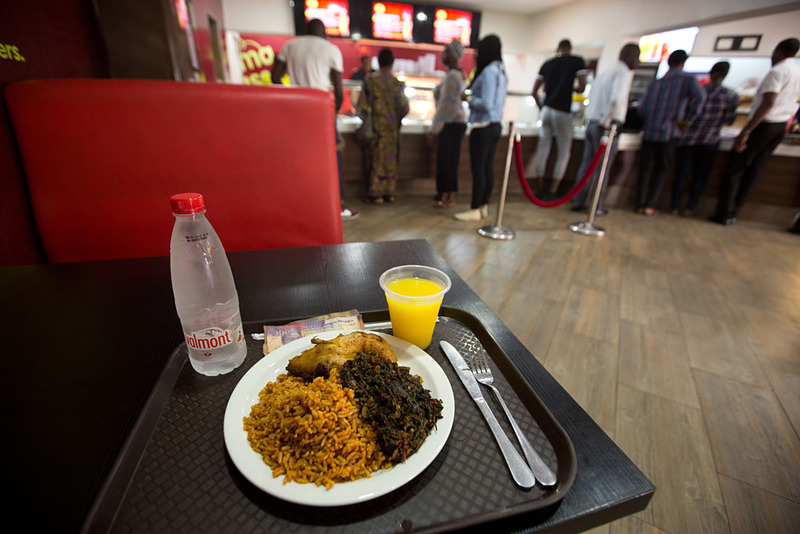 We then stopped for lunch at a local restaurant and had chicken, spicy rice and Efo Riro, a traditional Nigerian dish. 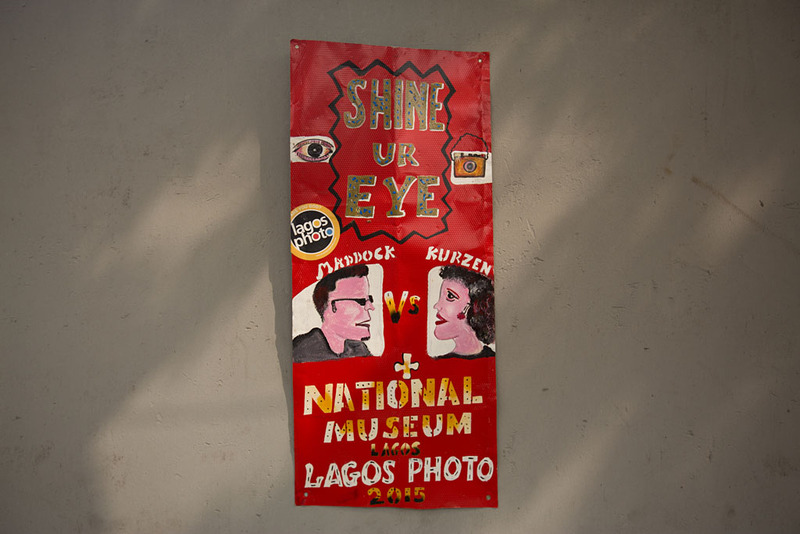 After lunch we drove off the Island and then out east to Lekki Penninsula and on to the Lekki Conservation Centre. 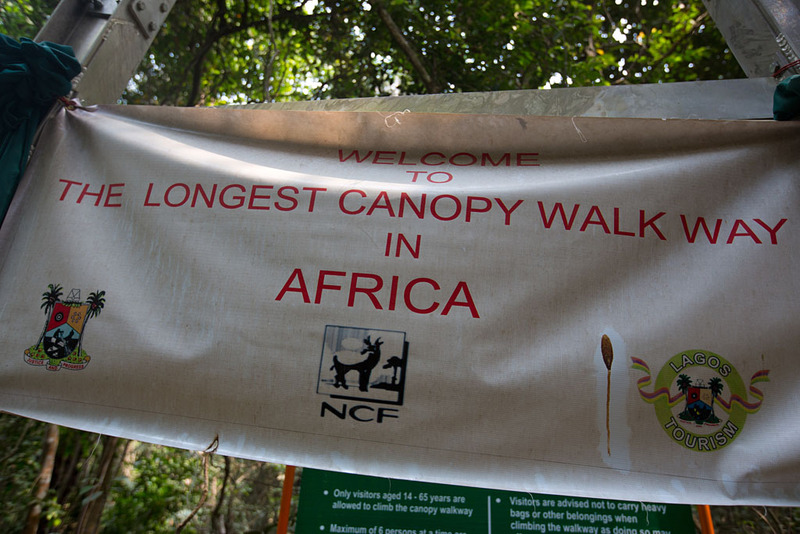 Entry was 1000 naira (~$5), plus another 1000 naira for the canopy walk. It was a very beautiful place and great to escape the chaos and noise of the city. 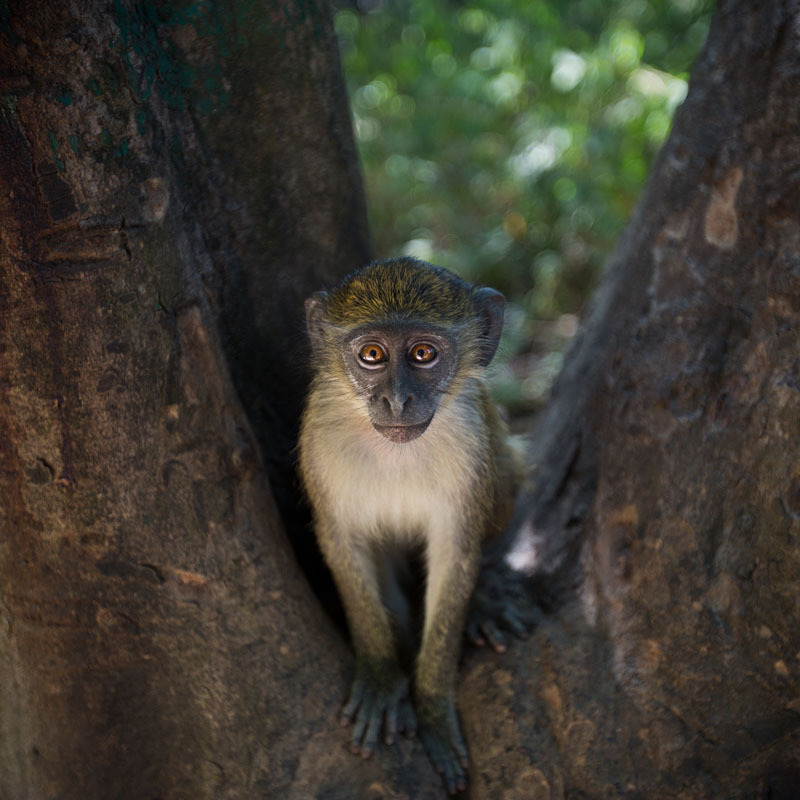 After hearing some rustling in the tree's, a few of the monkey's climbed down to have a peek at us. 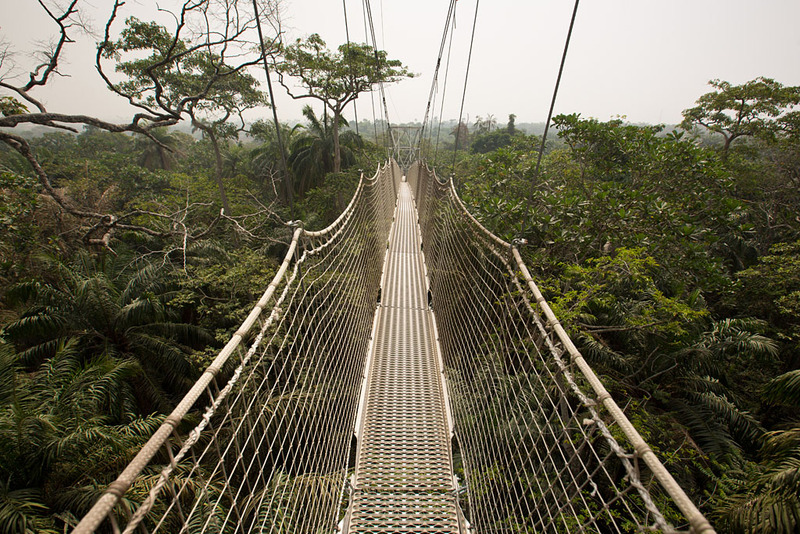 The Lekki Conservation Centre also has a canopy walk, the 'longest in Africa'. And the great view ~~50 meters above the trees. The canopy wirework wasn't 100% stable, so there was a bit of swinging about. There was a reassuring sign saying that this was 'part of the excitement' though! 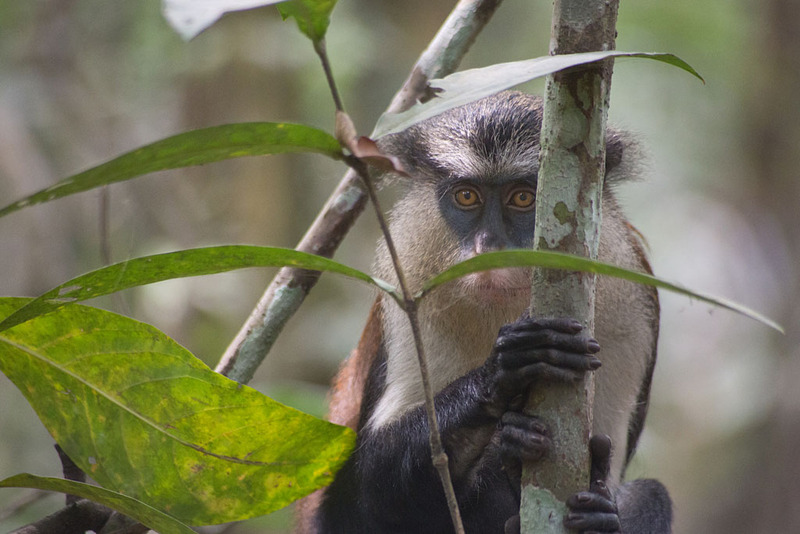 And another shy monkey peering behind a branch. We then headed back into the city. 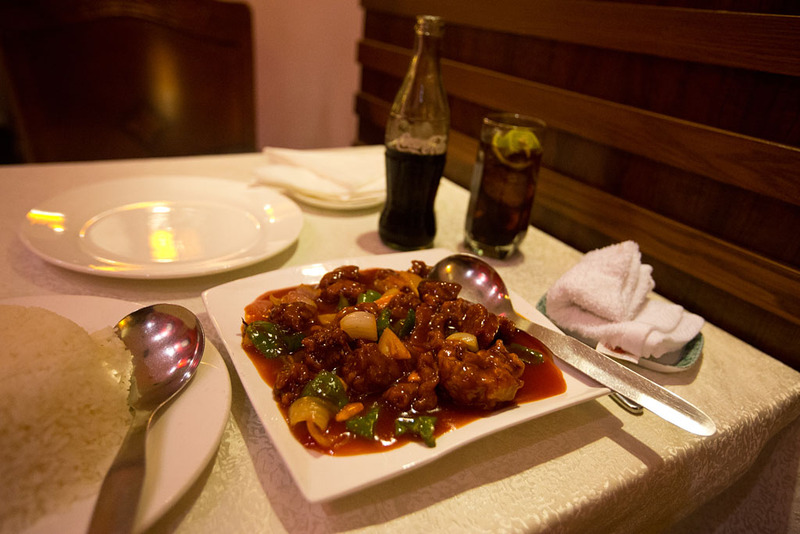 After resting up at the hotel, I went to Mr Chang's, a Chinese restaurant, for dinner and had some very tasty sweet and sour pork, steamed rice and an ice cold coke for 5700 naira (~$27). 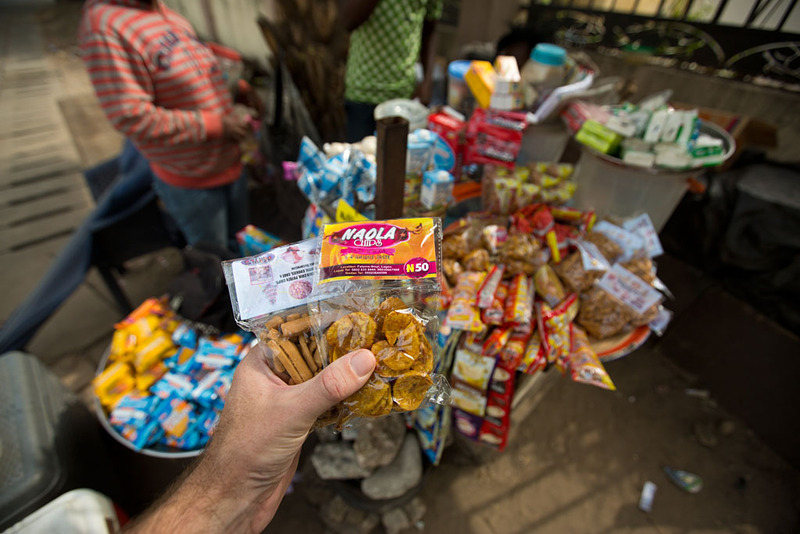 After a morning run along the streets of Lagos Island, I headed out and got some biscuits and banana chips for breakfast for 100 naira (~50 cents). 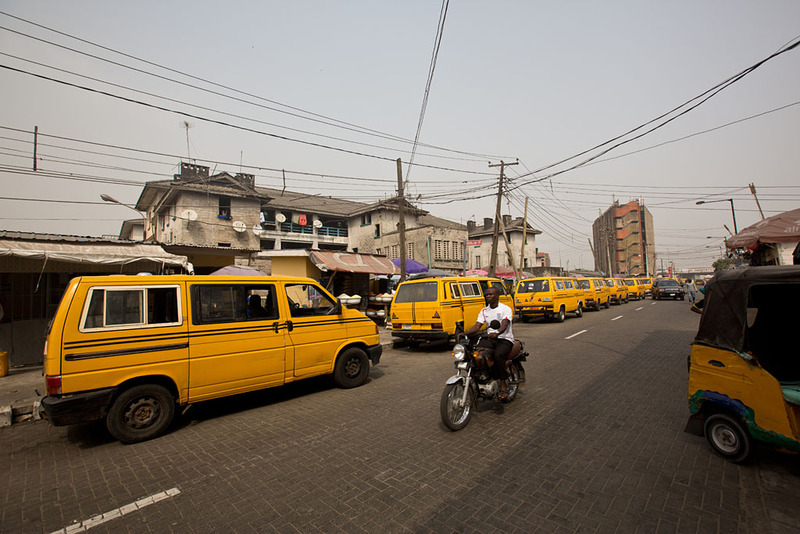 Yellow taxi vans lined up. A seemingly innocuous photo that managed to get me in trouble! 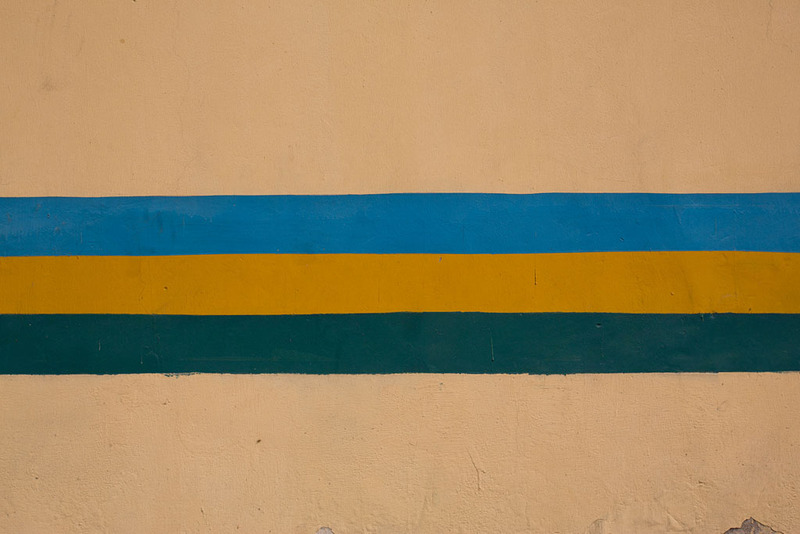 After taking a photo of the stripes on the wall, a policeman down the road yelled out at me. Apparently the wall was surrounding a police station! He was a short guy with a bit of a temper, and was trying to get me to come inside the police station for my trangression. I was very apologectic, showed him the photo, but he was still insistent I come inside. A bigger guy was there also who was apparently his boss. Although he wasn't talking in English, from his tone and body language he seemed to be telling the more aggro policeman to calm down as it was obvious I was just a tourist. The policeman still wanted to book me, but after my apologectic demeanour and gentle resistance not to come inside, as well as his boss seemingly telling him to calm down, the aggro policeman eventually relented and sent me on my merry way. 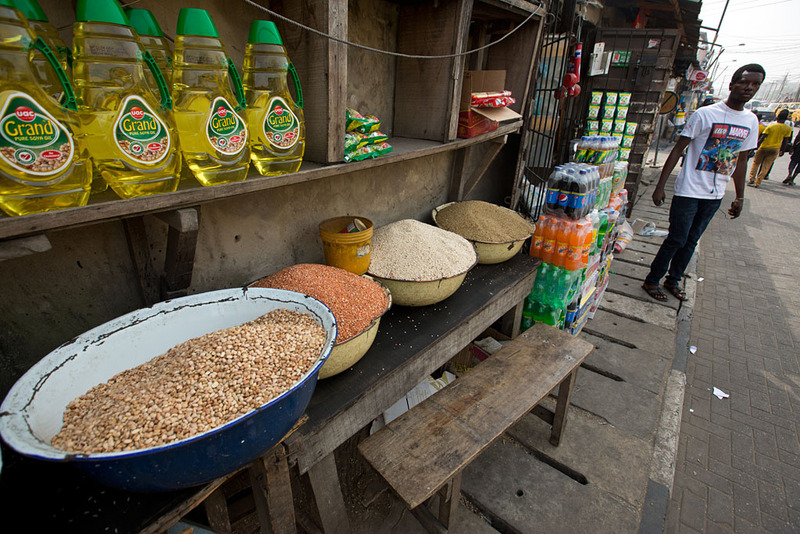 Grains and oil at Sura Market. 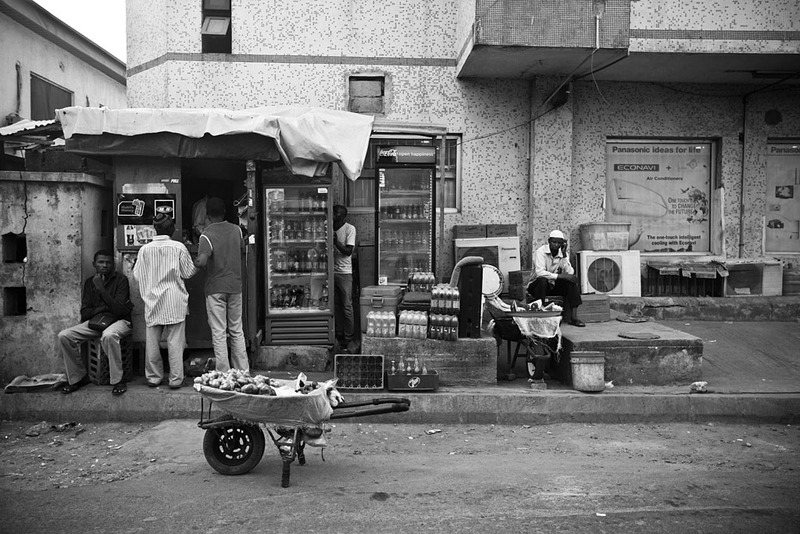 It was great to just walk about and take in the energy and vibe of Africa's biggest city. 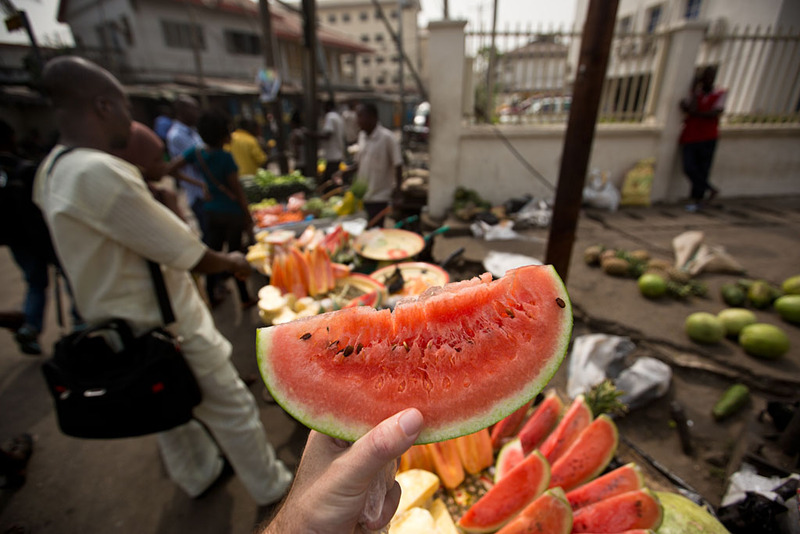 Getting some fresh watermelon for 50 naira (~25 cents). 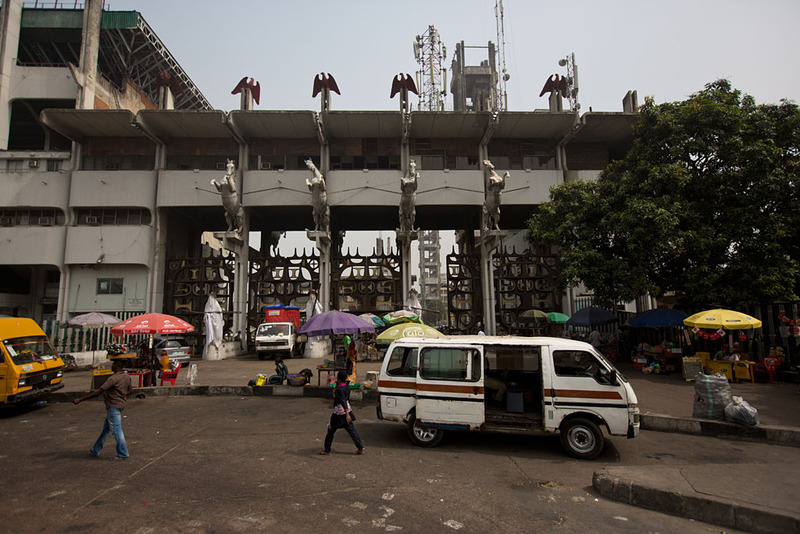 Four white horses and red eagles above the main gate at Tafawa Balewa Square, symbols from the national emblem that signify strength and dignity. 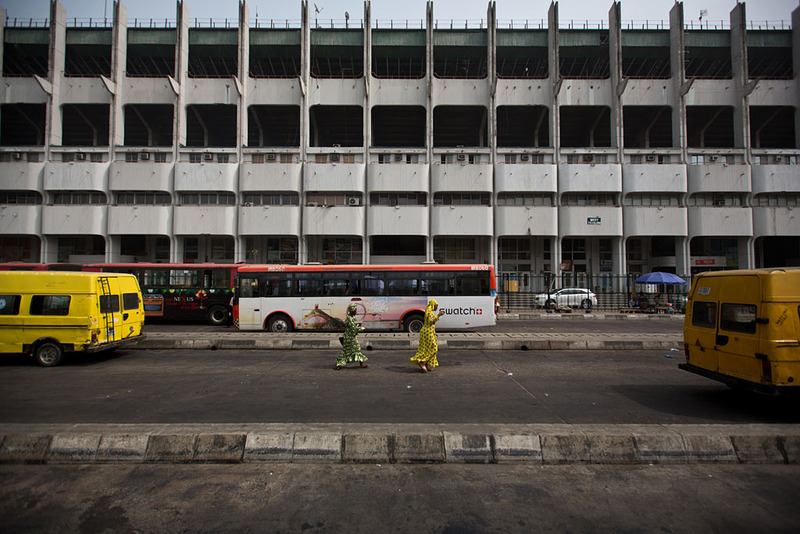 The square is named after Abubakar Tafawa Balewa, the first and only Prime Minister of Nigeria. 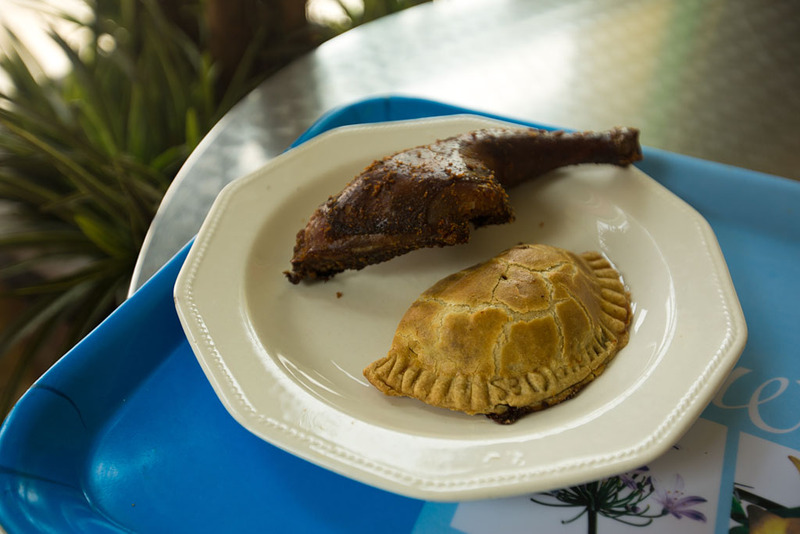 I then grabbed lunch at a place called 'Munchies' and had a meat pie and a dodgy looking piece of chicken. Cathedral Church of Christ. 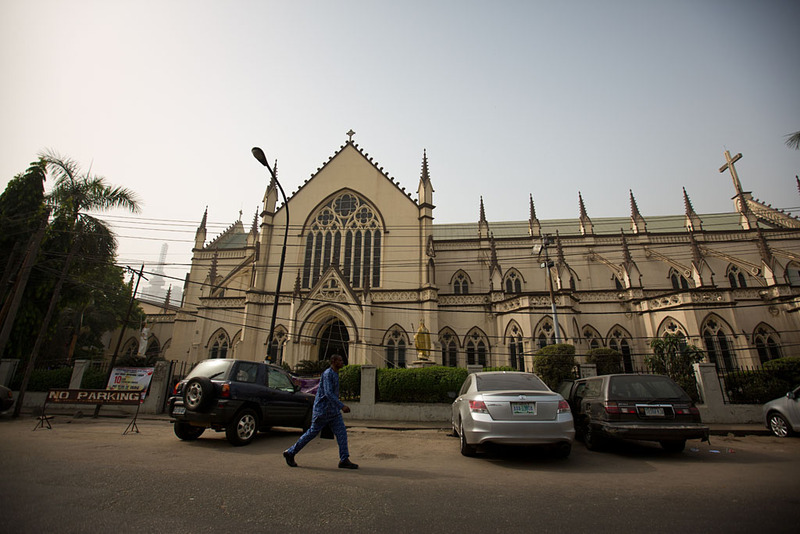 The foundation stone was laid by the Prince of Wales in 1925 and the church was eventually completed in 1946. 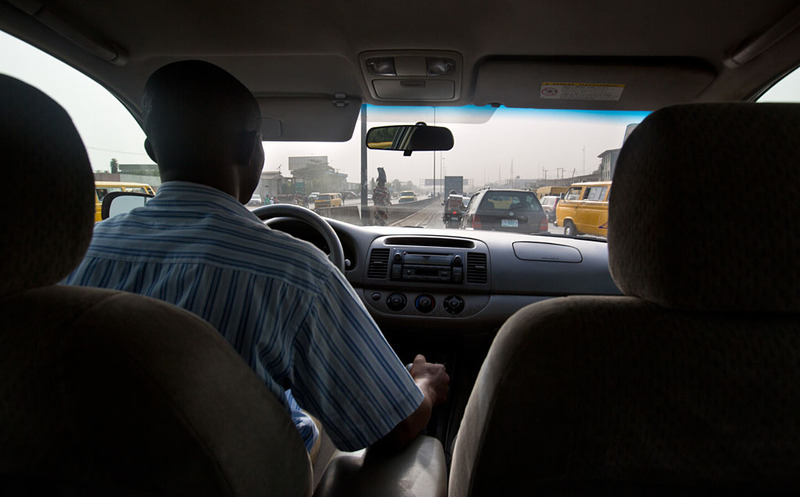 After chilling out at the hotel, I then met up with Ajiboye at 4pm for the drive to the airport. 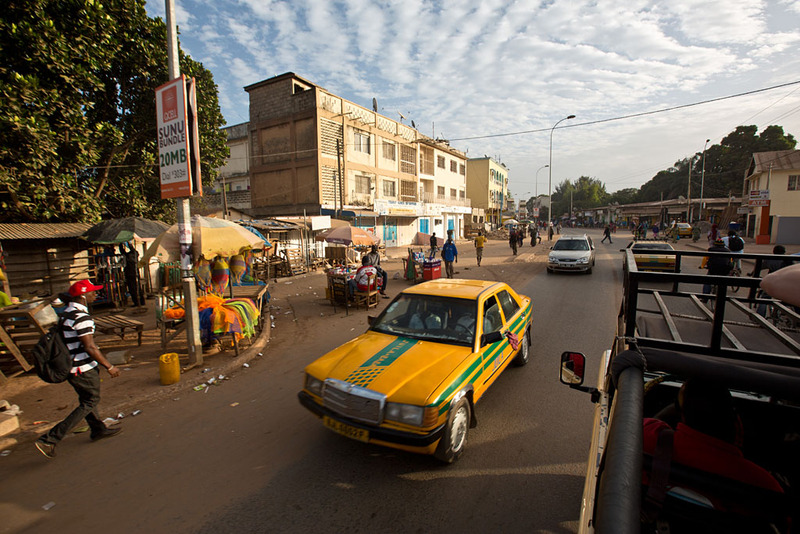 My flight to Banjul wasn't until 7:30pm, but the journey can take up to 2 hours in peak hour traffic. Fortunately we made it there just before 5pm with plenty of time to spare. 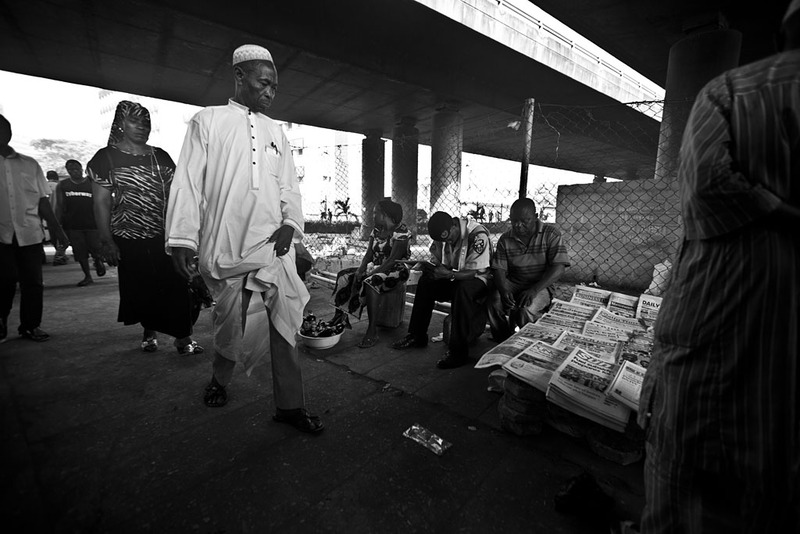 Ground-side at Murtala Muhammed International Airport. 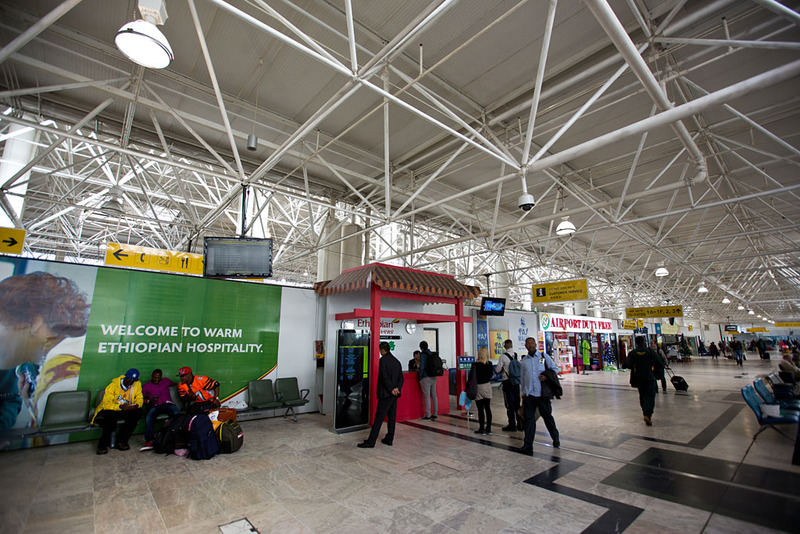 I had a bit of a panic when my flight to Banjul was missing from the departures screen. 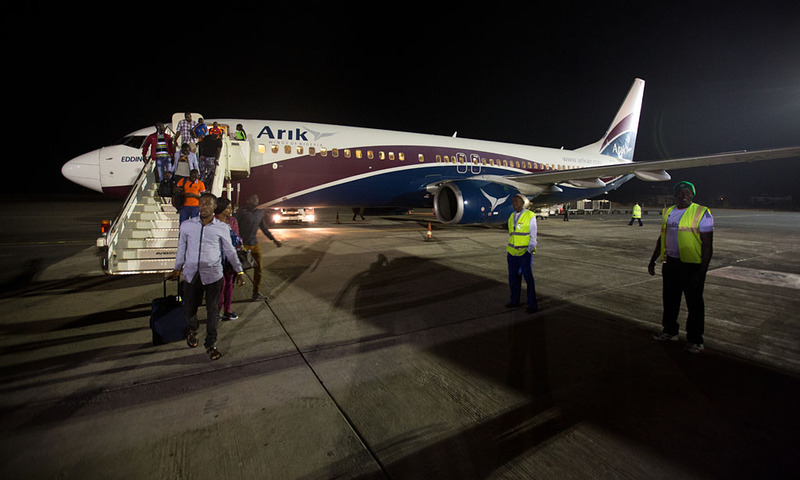 They were checking in another Arik Air flight to Ghana, so I went up to enquire about the Banjul flight. Luckily the flight was still scheduled and they quickly gave me my boarding pass. 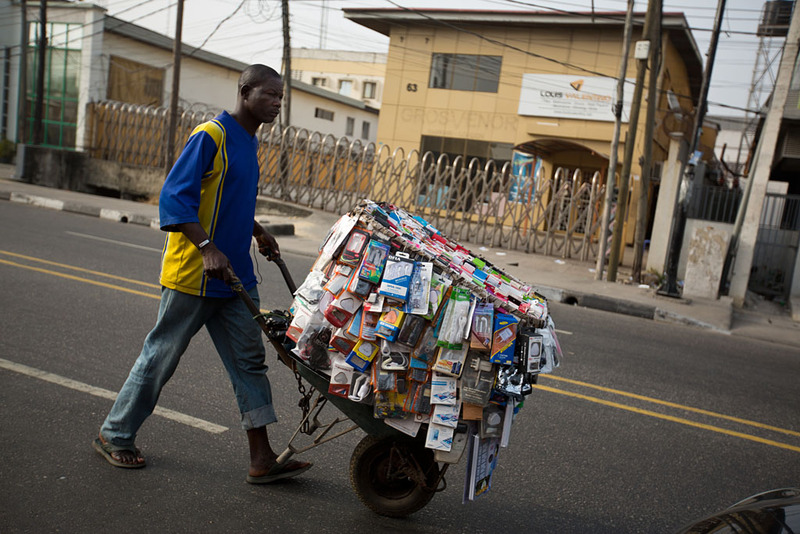 Spending my last naira on some water and snacks. Again, I was apprehensive about possible corruption at the airport but had no issues whatsoever getting through immigration, customs and security. Our 737 for the flight to Banjul (and on to Dakar). 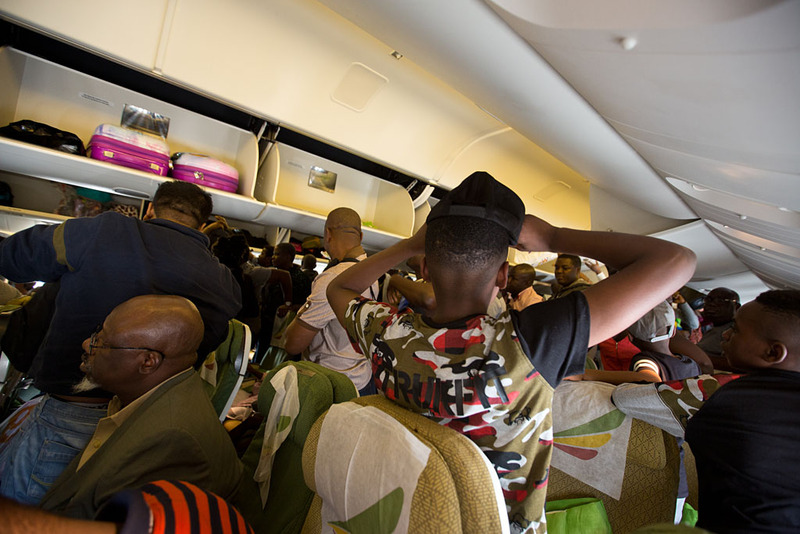 After a 2 hour delay was announced some of the other passengers started to get a bit irritated with a bit of yelling and cursing, but as it was my first time flying a Nigerian airline I had low expectations and was just glad for it to be operating at all. 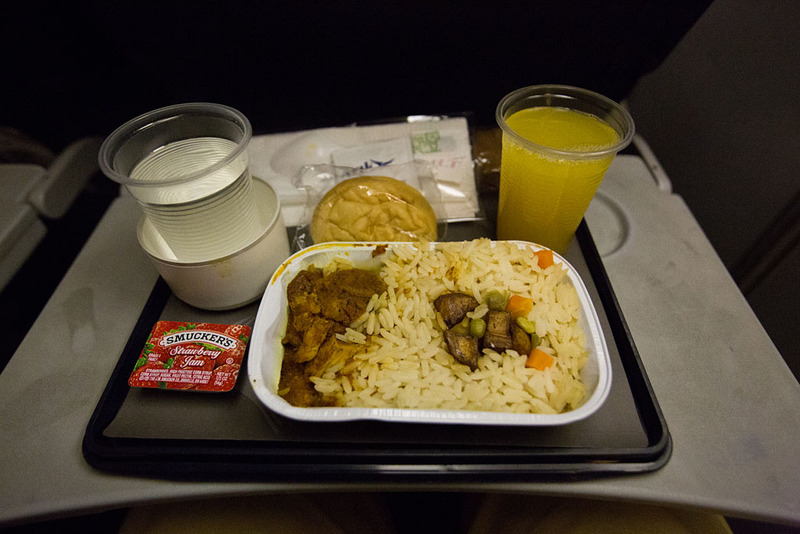 We finally departed at 11pm, and were then served chicken and rice on the 3.5 hour flight. And arriving at Banjul at 1:30am. 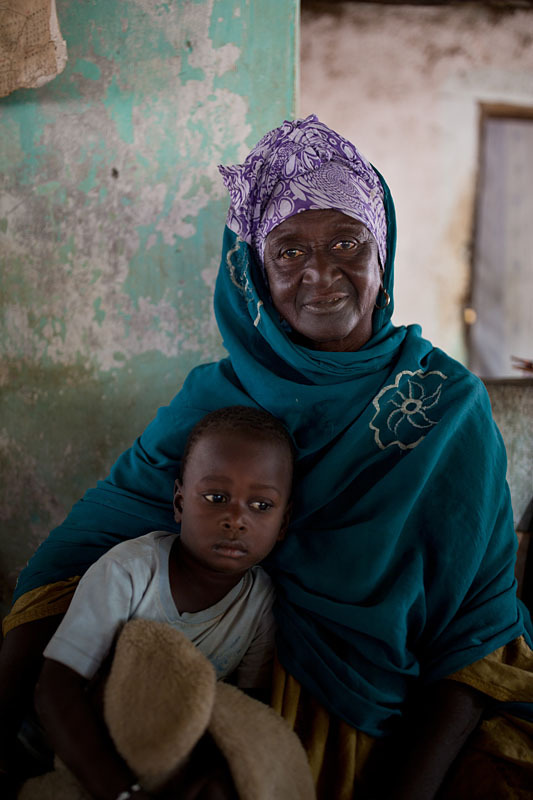 And waiting in line for the luggage X-ray after being stamped into The Gambia, my 17th new country visited in 2015. 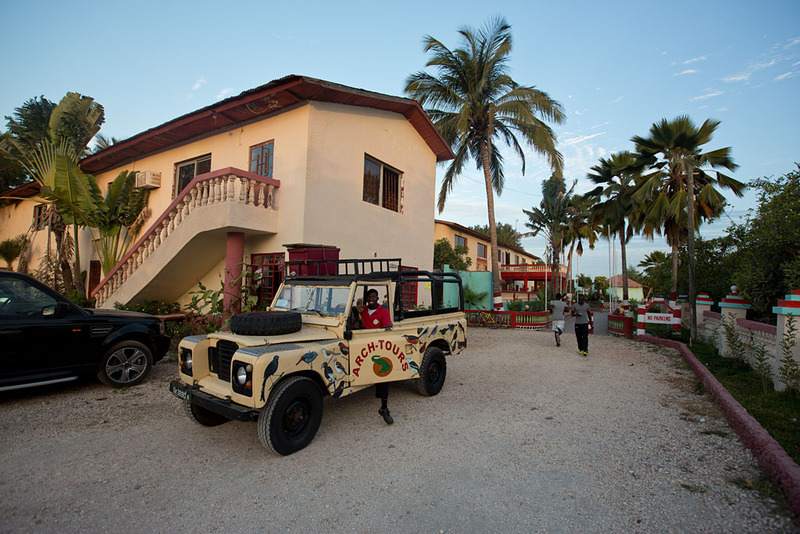 I then caught a taxi for 700 dalasi ($17) to the Palm Beach Hotel. The hotel was rated 2 stars and only cost 35 euro a night including breakfast, so I had low expectations. The wifi was super slow but the AC was fine, and it had a perfect location right on the beach. 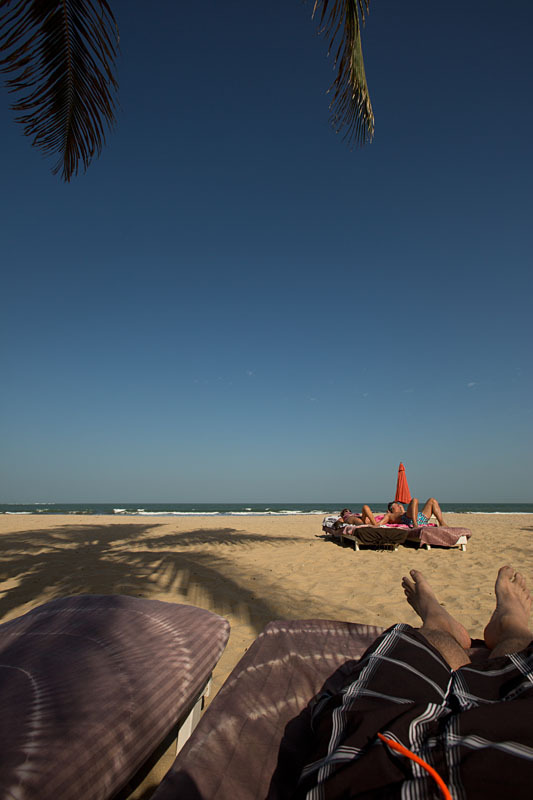 I then crashed out at 3am, ready to get up at 7am for a tour of some of the sights of The Gambia tomorrow. After a decent breakfast at the hotel, I then met up outside for the tour I had organised with Arch Tours. There were also some Brits at the hotel on the tour, with 10 of us total in two land rovers. 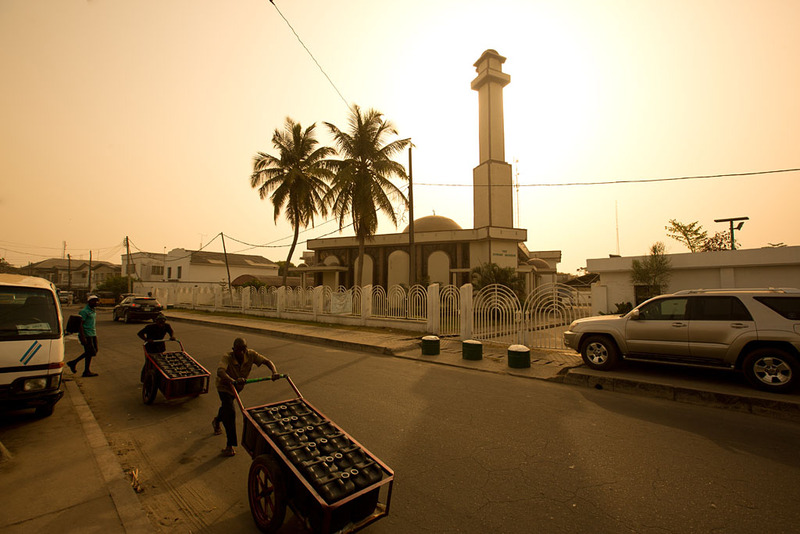 We then went for a drive through, Serrekunda, the largest town in The Gambia. 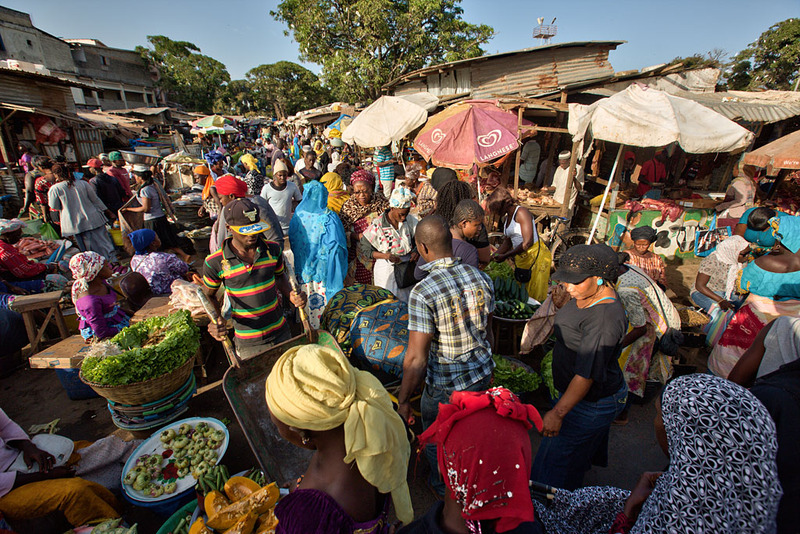 We then stopped to walk around the bustling Serrekunda markets, the biggest markets in The Gambia. 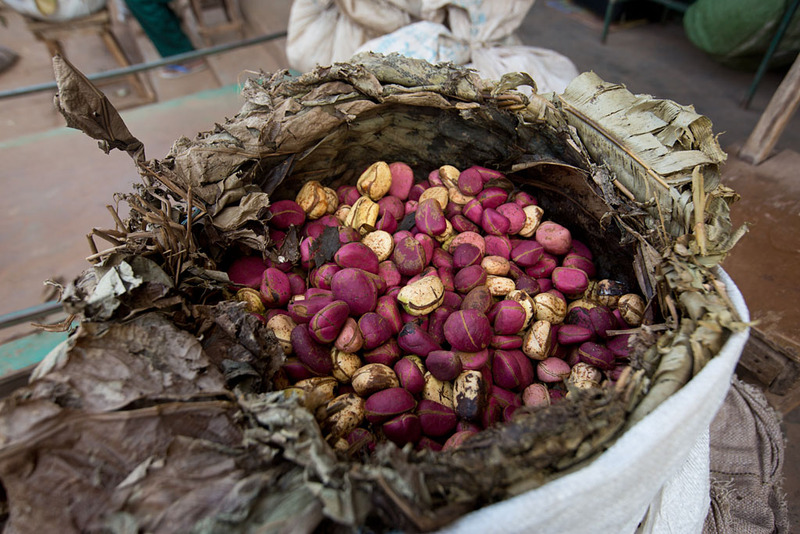 Kola nuts. The nuts contain caffeine and are perhaps best known to Western culture as a flavoring ingredient and one of the original sources of caffeine in cola beverages. 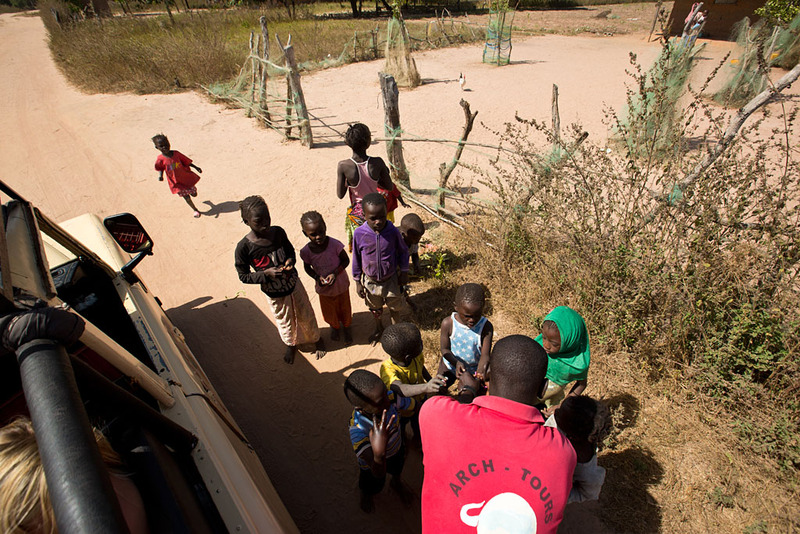 We then loaded back into the 4WD's for a visit to Kachikally Crocodile Pool. 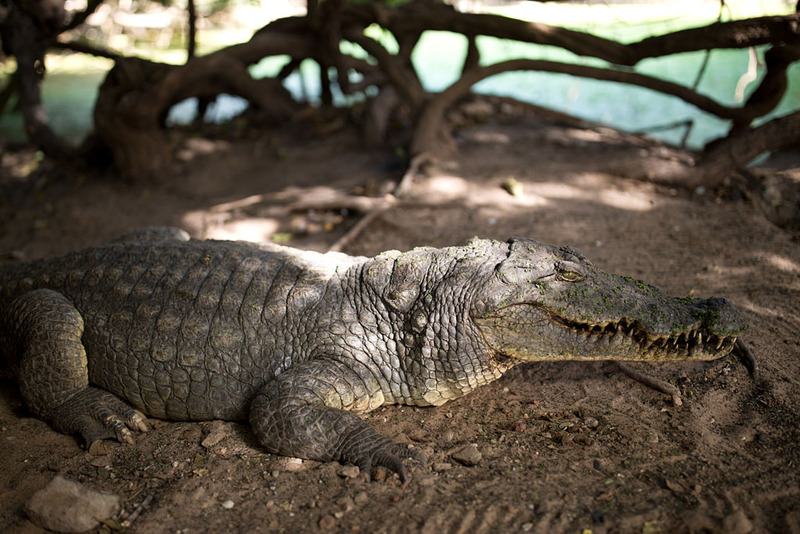 The crocodiles are relatively docile and are allowed to roam relatively freely. Quite an eerie experience getting so close to these guys with nothing in between. After making sure they weren't hungry by feeding them a big breakfast of fish, we then got to get up even closer to them! 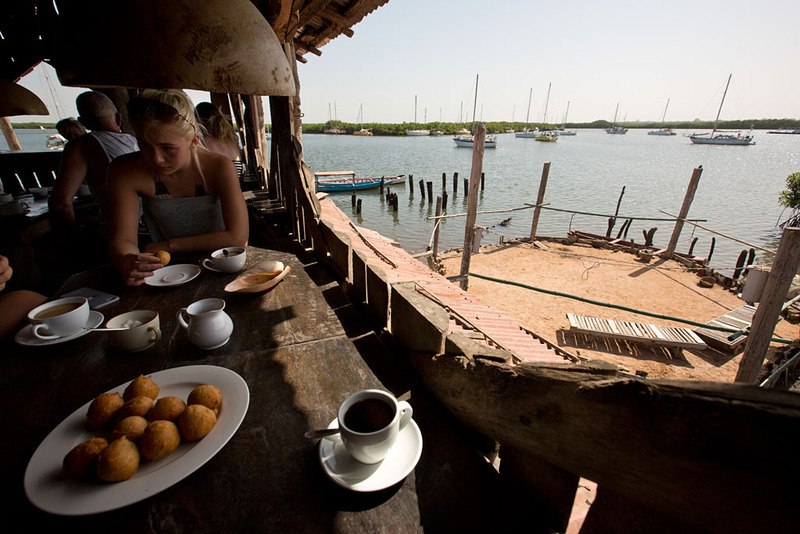 We then went out to Lamin Lodge, set in the mangroves of a tributary of the Gambia river, for donuts and coffee. 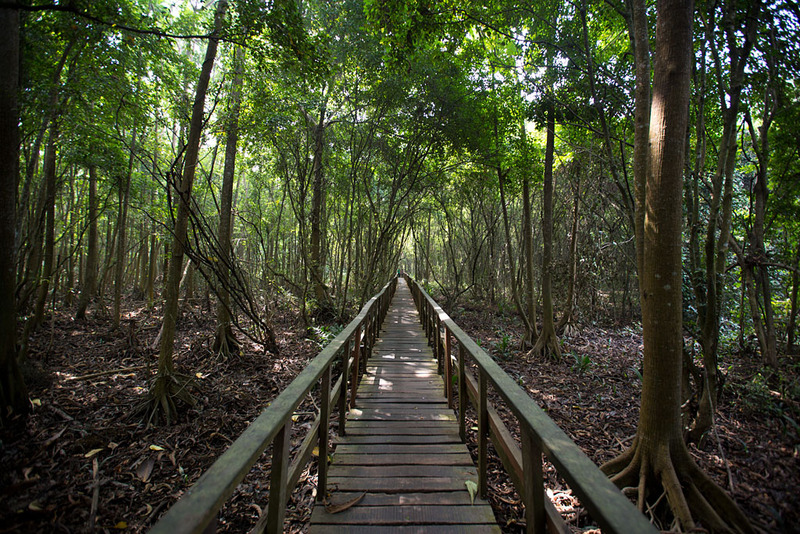 In the mangroves they also farm oysters. 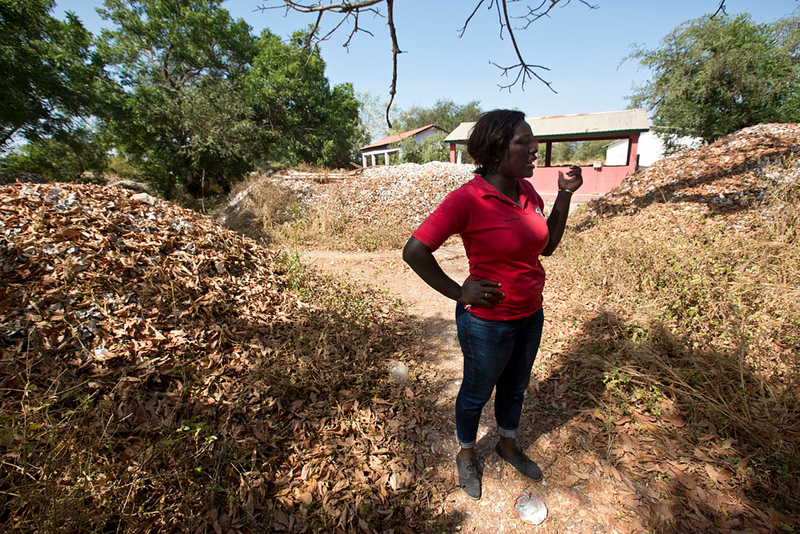 Our guide Marie showing how all the oysters shells are then ground up and used for painting local houses. We then went 'off road' driving through some of the local villages. Some of the other guys had brought sweets for the kids also. 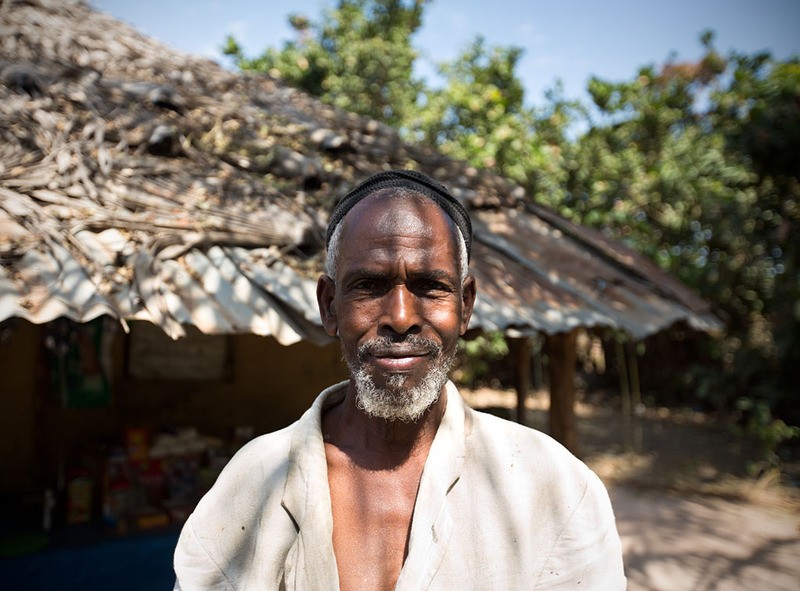 We then got to meet a local Gambian family, living simply in their wooden, two-room hut and small plot of land. 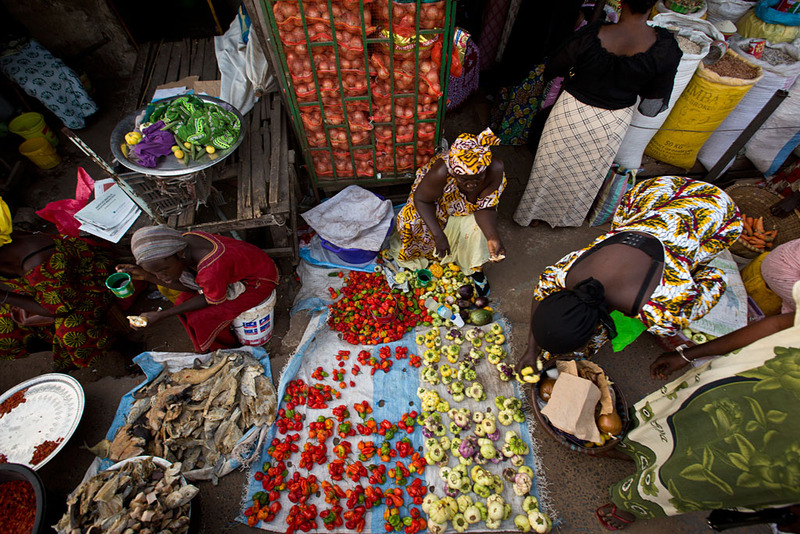 About a third of the population lives below the international poverty line of US$1.25 a day. 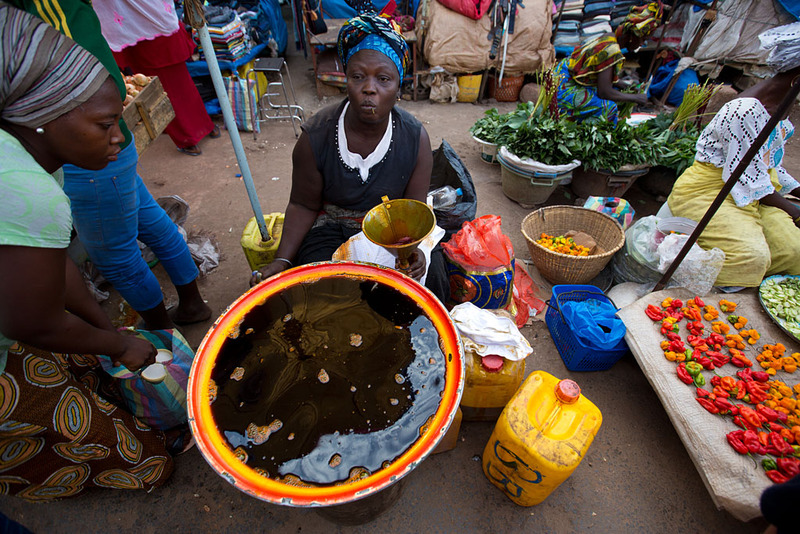 It was great to see some of The Gambia beyond the beaches and hotels. 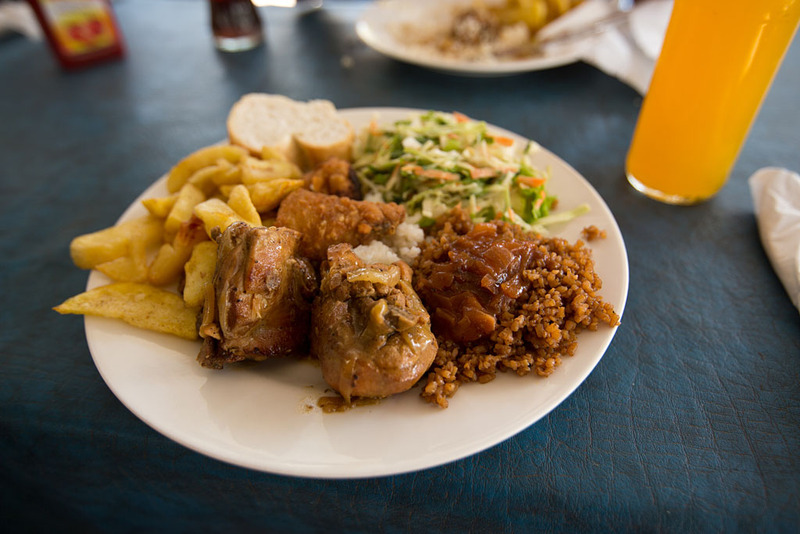 We drove on to the coast to Paradise Beach, where they had a pretty good buffet spread out for us for a late lunch at about 3pm. And then went for my first dip in the chilly Atlantic Ocean before retreating to the safety of a sun lounger! 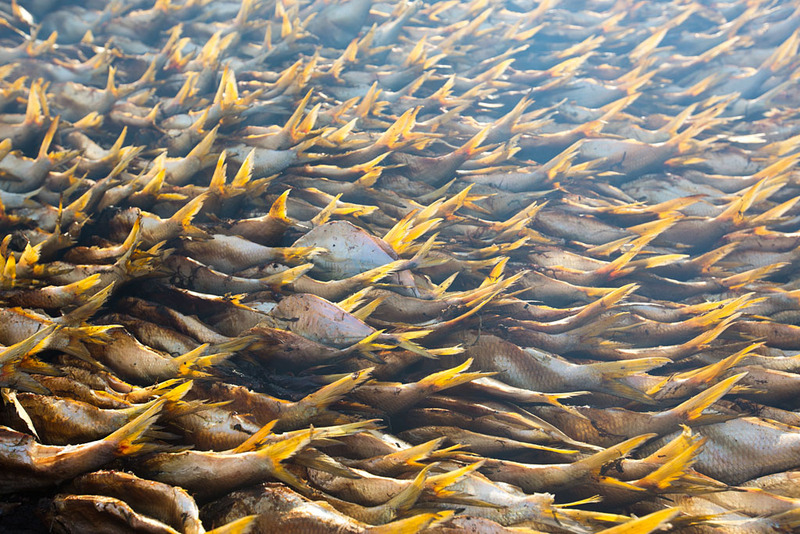 At 4:30pm we packed into the back of the 4WD's again and stopped at Tanji Fishing Village, where they had large huts with fish being smoked. 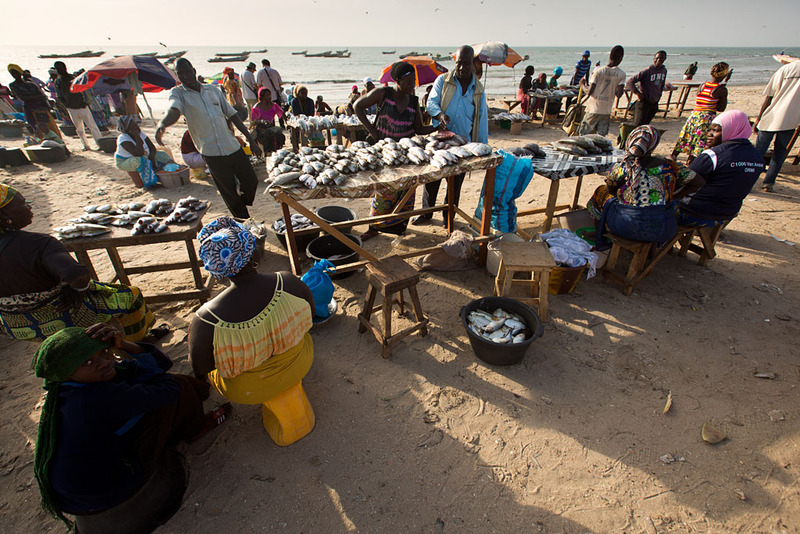 Tanji reminded me of our visit to the Port de pêche in Nouakchott, albeit on a much smaller scale. 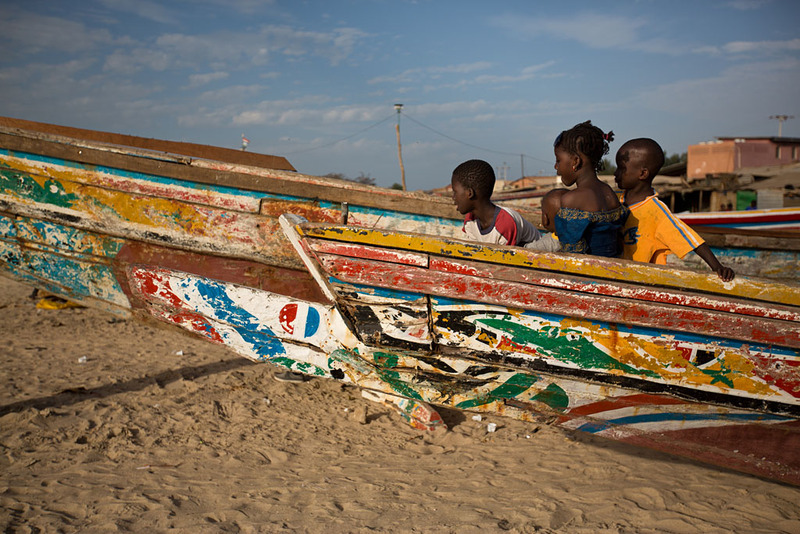 Kids playing in the colourful wooden fishing boats which we also saw in Saint Louis, Senegal. 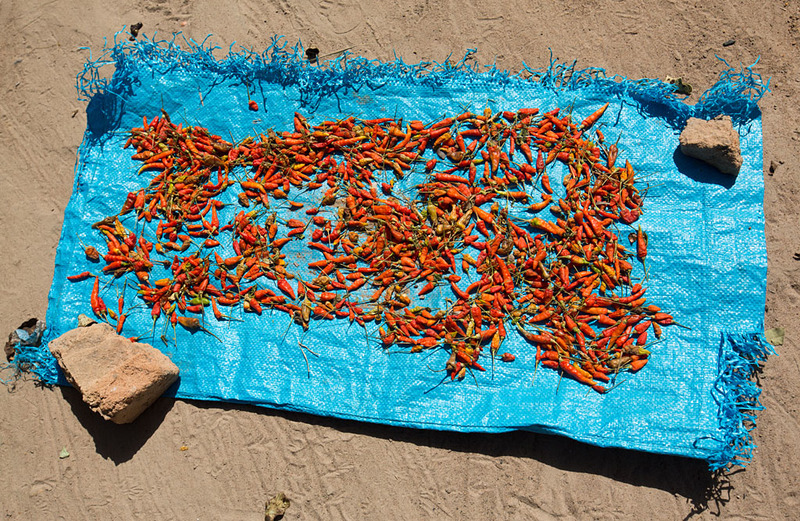 The day's catch for sale. 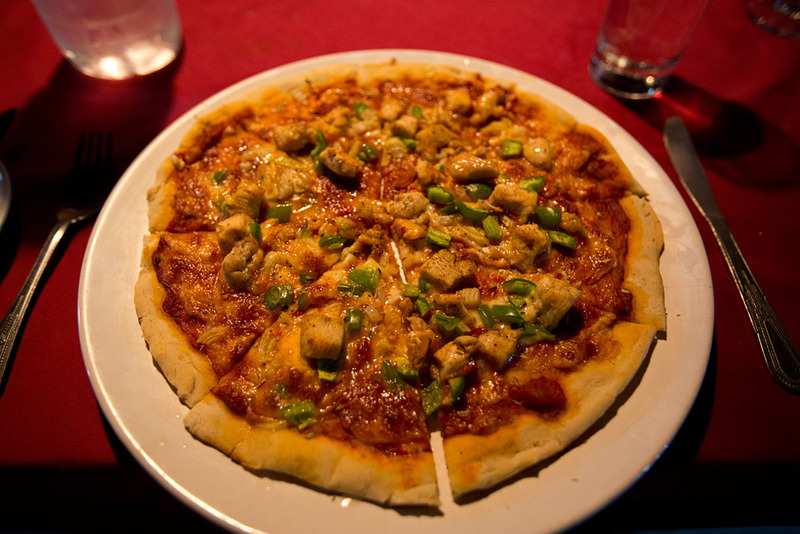 After being dropped off back at the Palm Beach Hotel just after 6pm, I went for a walk to one of the local restaurants and had some tasty chicken pizza after a very cool first day in The Gambia. 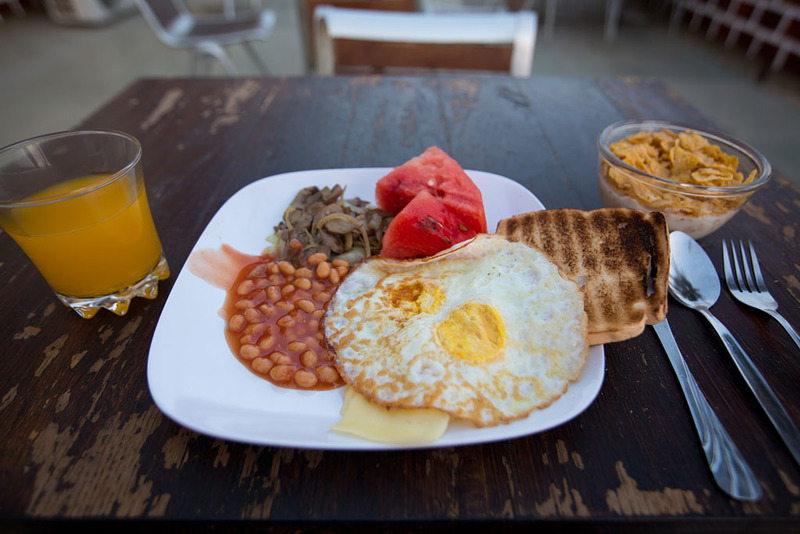 After a morning run, I had breakfast at the hotel. 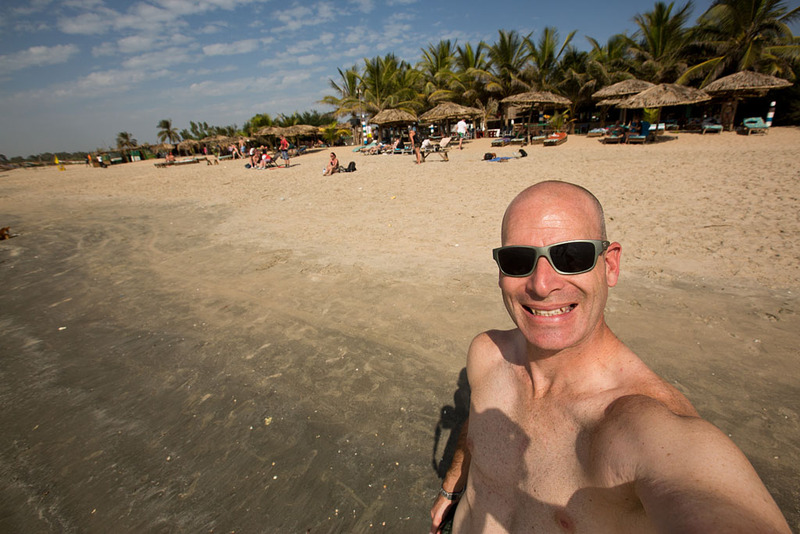 After a busy few days behind and ahead of me, I opted to make the most of the beach and take it easy. 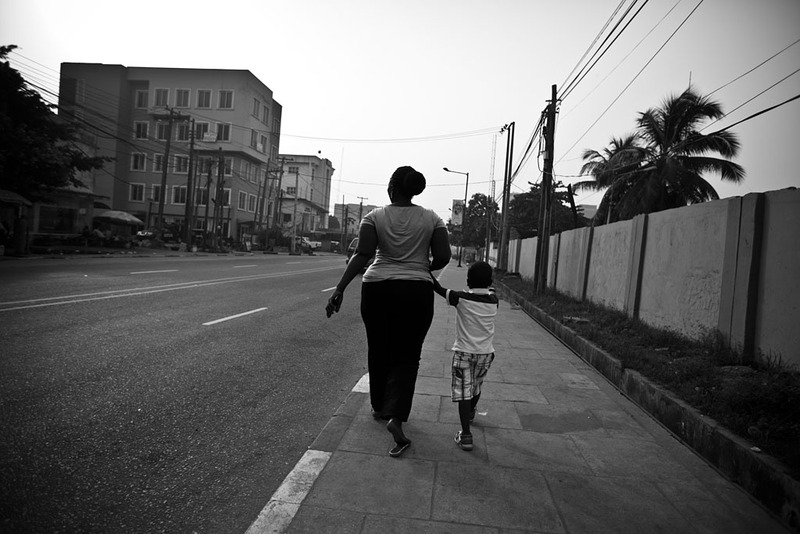 After a very lazy morning, I headed off for a walk down the main road. 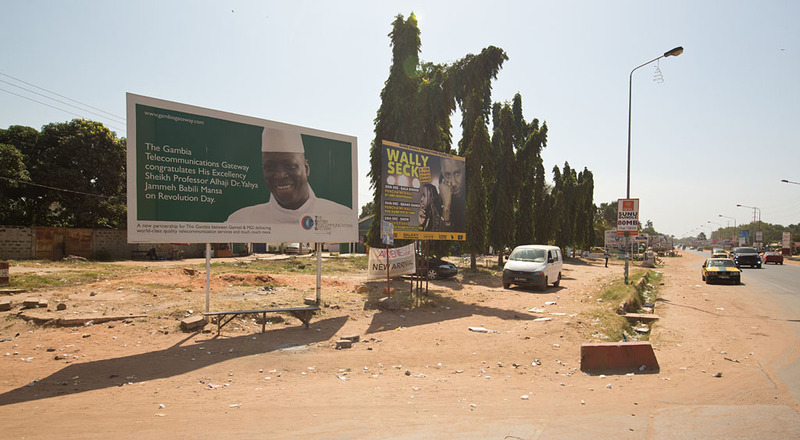 On the left is a billboard with President Yahya Jammeh, or his proper full name of His Excellency Sheikh Professor Alhaji Dr. Yahya Jammeh Babili Mansa. About ~2.5 kilometres down the road, I found Bijilo National Park, and after hiring a compulsory guide, went for a wander. 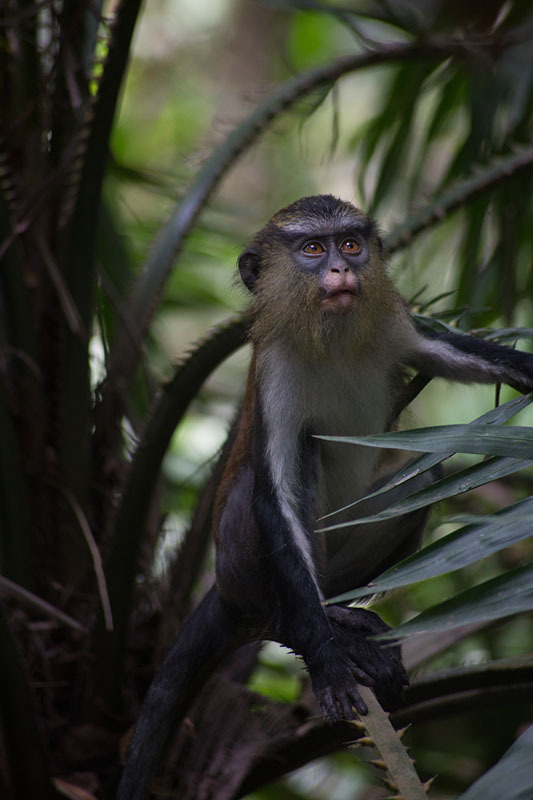 Unlike the shy monkey's I saw in Lekki, Nigeria these guys were not afraid of at all, and even had their hands out for nuts that other tourists were feeding them. 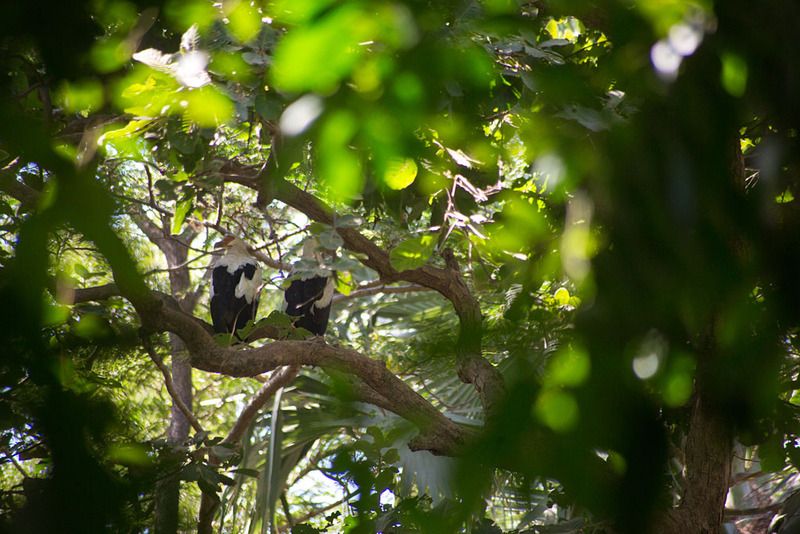 A couple of Palm-nut vultures in the trees. As their main diet is mostly fruit, my guide said they are usually called 'Vegetarian Vultures'. After walking back to the hotel, I joined the package holiday tourists and lazed out at the hotel pool. I didn't have the energy to go far for dinner, so just had some tasty fish and chips at the hotel pool-side restaurant for dinner for ~10 euro's at the end of day 5. 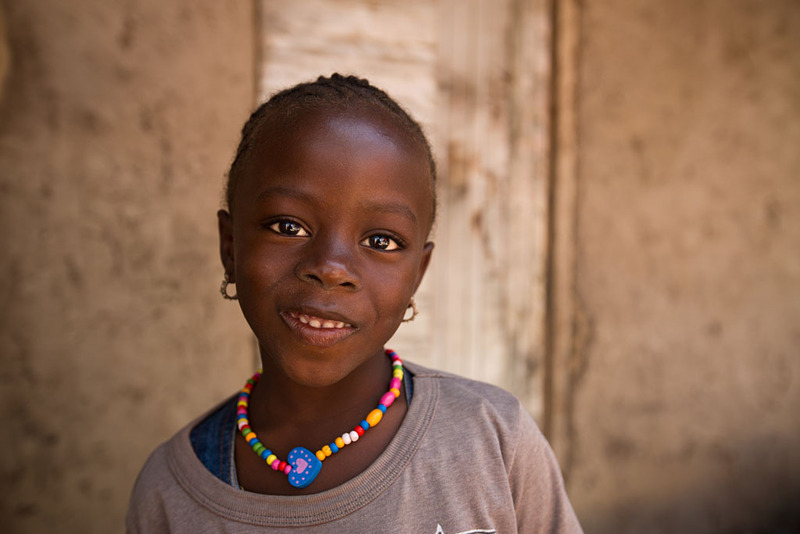 I had managed to read a few emails on the super-slow wifi, and confirmed that Jason and Jordan had made their flight to Banjul from Brussels, and to meet up with them for the start of our West African adventure tomorrow. I had booked a 'Roots' river cruise tour through Arch Tours, and when the tour bus pulled up at just after 8am, was glad to see Jason and Jordan had arrived ok and the tour bus had picked them up earlier at their hotel. 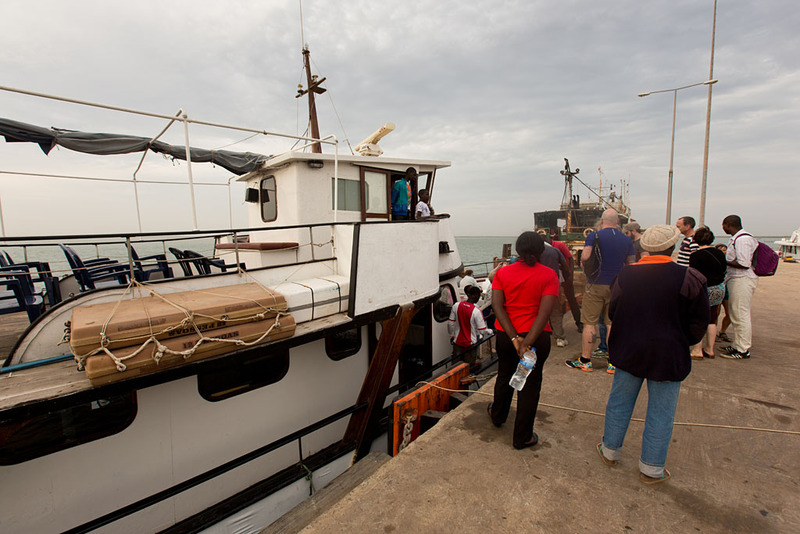 The bus then took us to the wharf in Banjul, ready to board our boat for the cruise up the river. 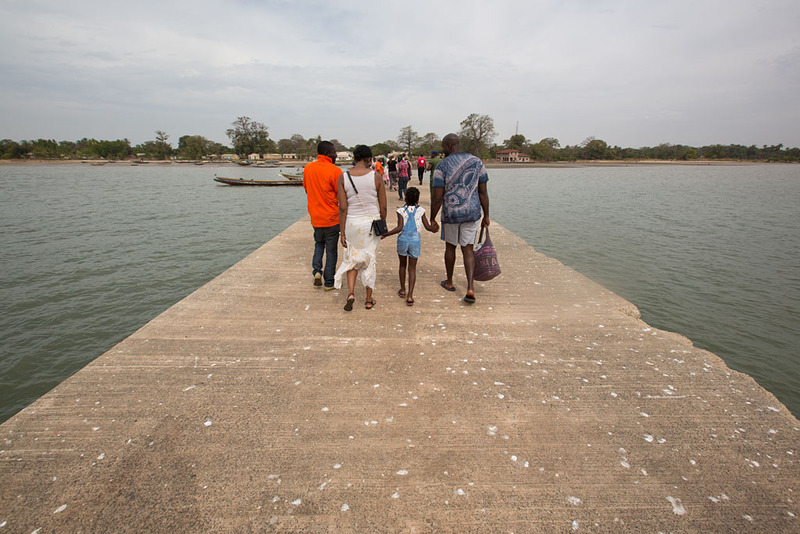 Our cruise would depart from Banjul, and cruise up the Gambia river to the villages of Albreda and Jufureh and on to Kunta Kinteh Island. 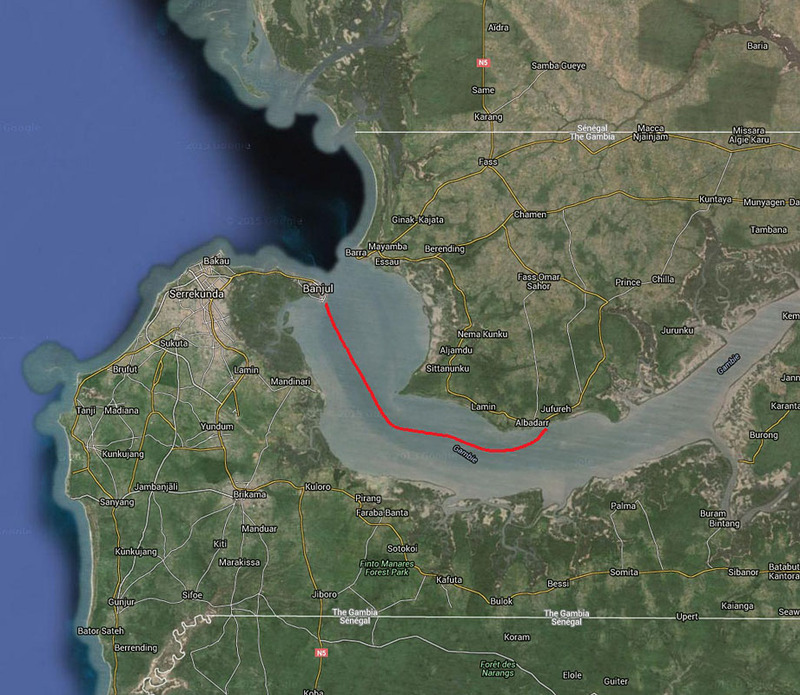 As we were sailing against the tide in both directions, it would take ~2.5 hours each way. Just before 12pm, we docked and disembarked to begin our 'Roots' tour. 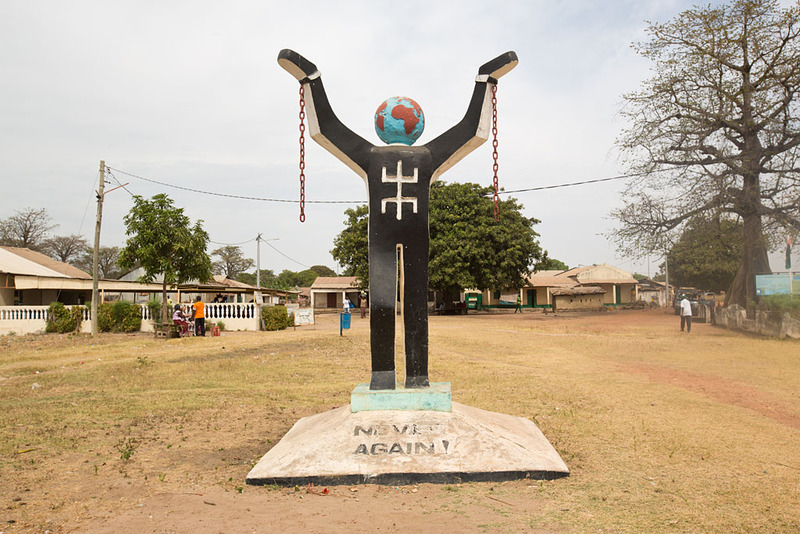 Never Again! 'Roots' is a semi-fictional book written by the American writer, Alex Haley. 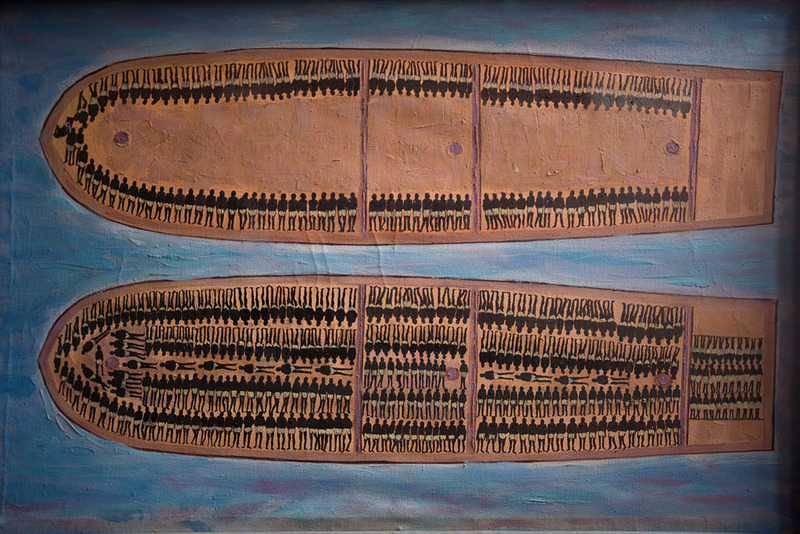 The book is about a Gambian man from Jufureh, Kunta Kinte, born in 1750, enslaved and taken to America and where he died in 1822. 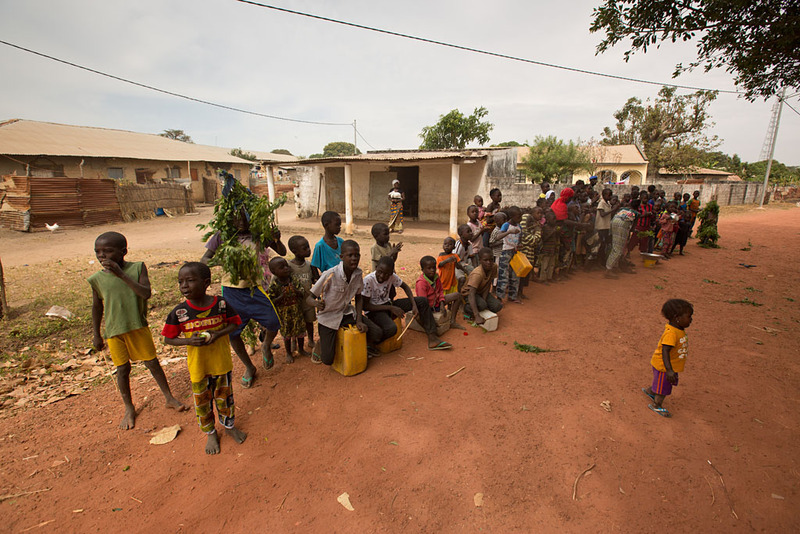 We then walked through the village where the local kids were giving a bit of a show. At the Albreda Slave Museum, which had history from the slave trade and all the way up to Martin luther King Jr.
Jordan with one of the locals who had brought along a Kora. 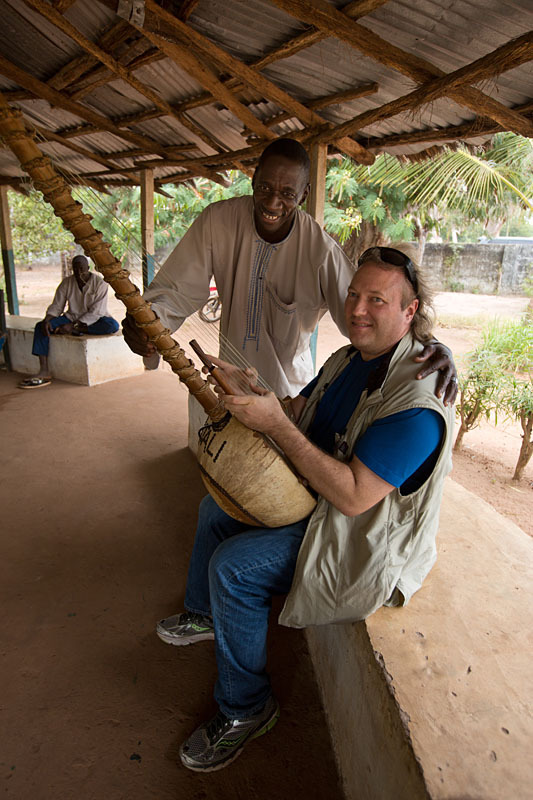 Jordan had a Kora back home from one of his previous West Africa trips, and showed off his African music making skills! 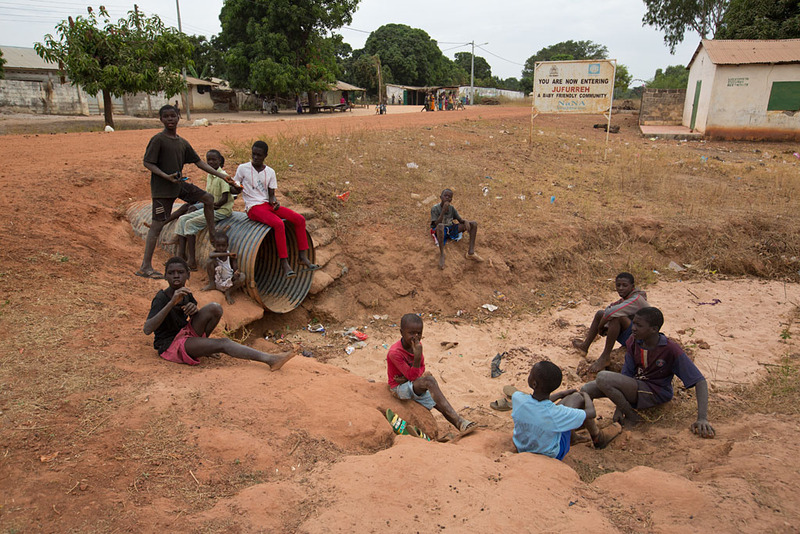 Some more of the local kids. 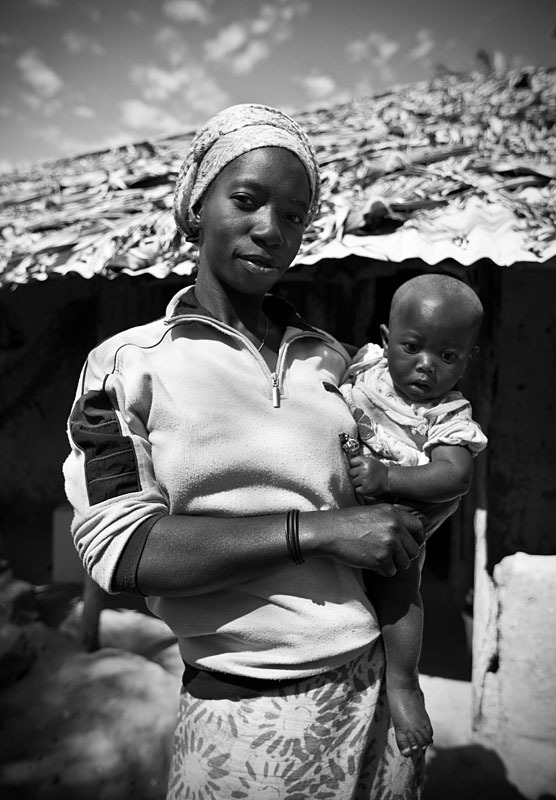 We then met some of the local ladies who were descendants of Kunta Kinte. Who graciously posed for a photo for us. 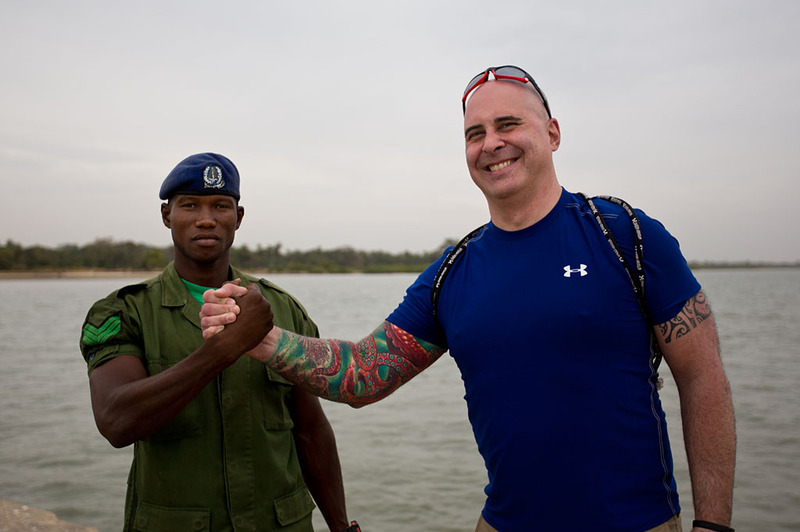 Jason had also managed to make friends with one of the policemen who were escorting us and got this cool shot of them together back at the dock. 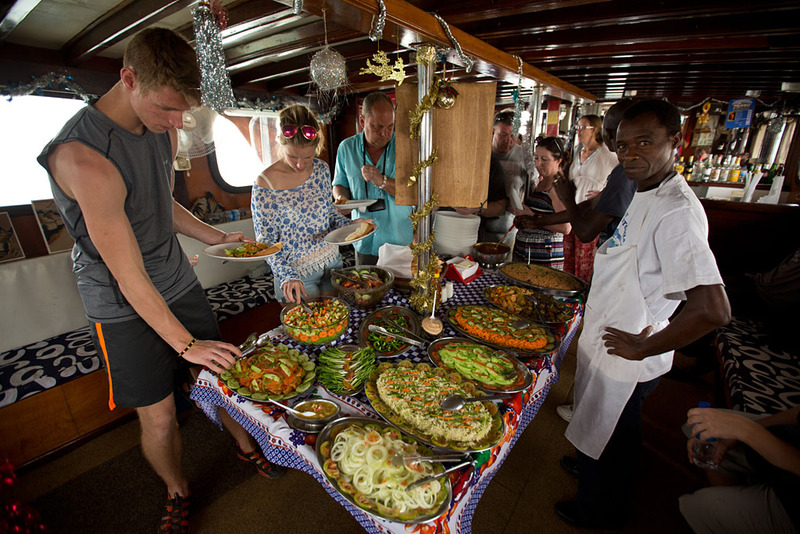 After boarding back at the boat, we had lunch of salads, rice and fresh shrimp from the Gambia river, very tasty! 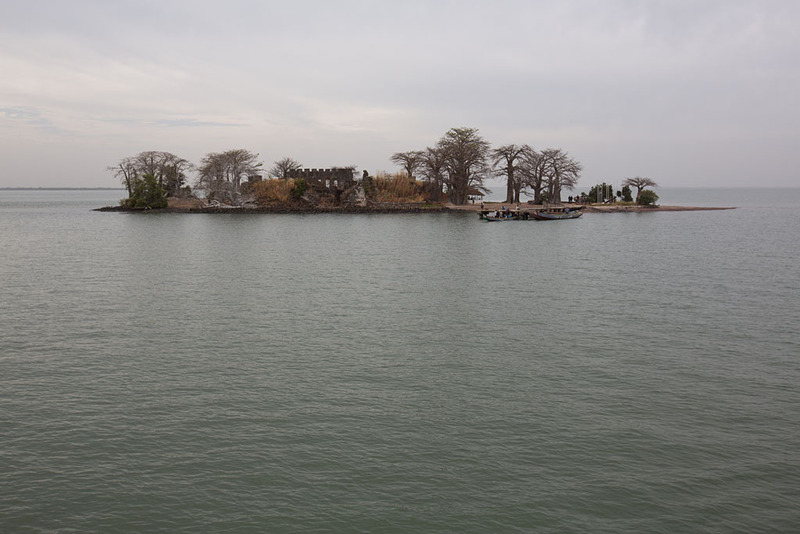 We then sailed into the middle of the river to Kunta Kinteh Island. 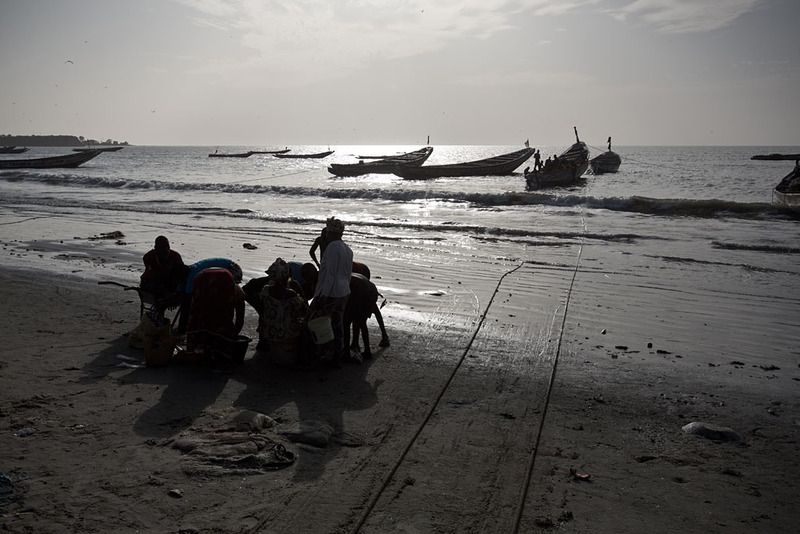 The island is an important historical site in the West African slave trade and is also a UNESCO World Heritage Site. Catching a wooden boat to the island with our river boat just behind. The ruins of the old fort. 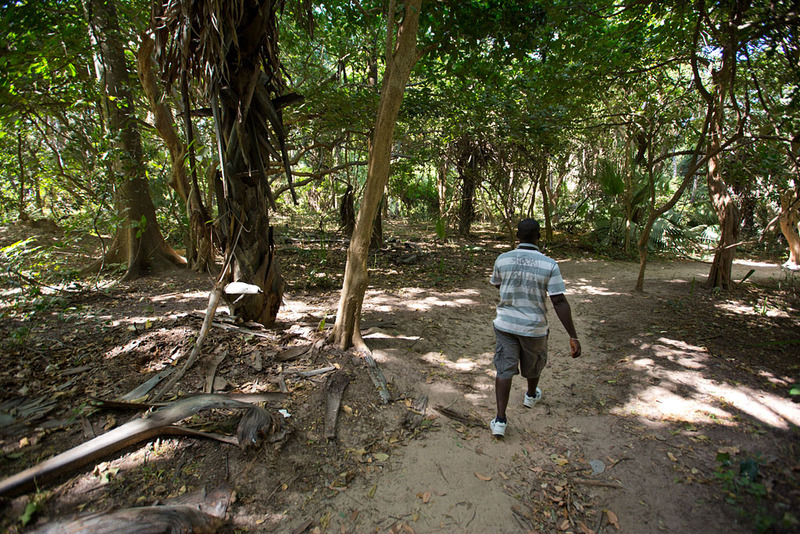 The island was initially used for gold and ivory trade, and later in the slave trade. The low-lying island has had significant erosion, and is now approximately 1/6 of the size during the time when the fort was active. 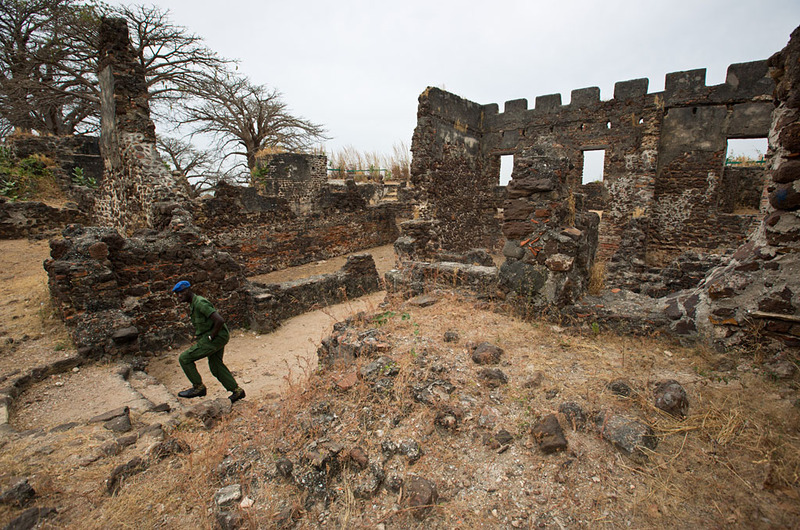 Reinforcements have been made in recent years however to minimise further loss of the island. 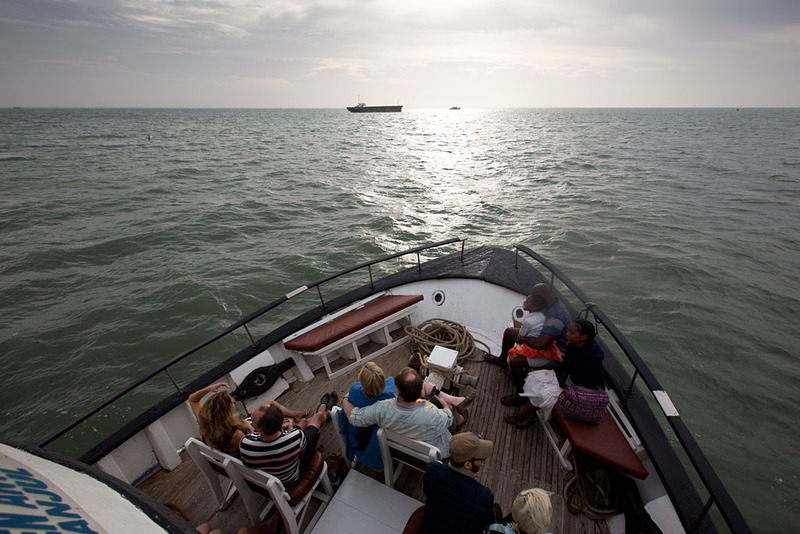 After a leisurely cruise back to Banjul, we stopped at the Arch 22. 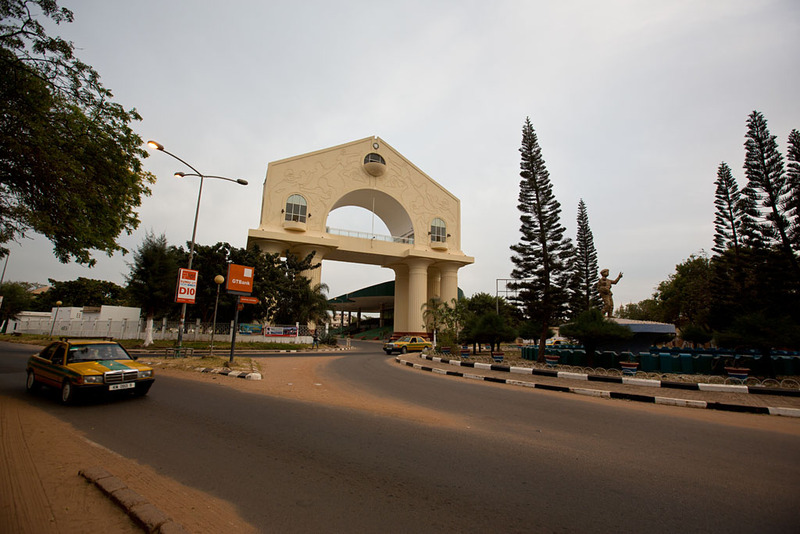 The arch was built in 1996 to mark the military coup d'etat of July 22, 1994, through which Yahya Jammeh, the current president, gained power. 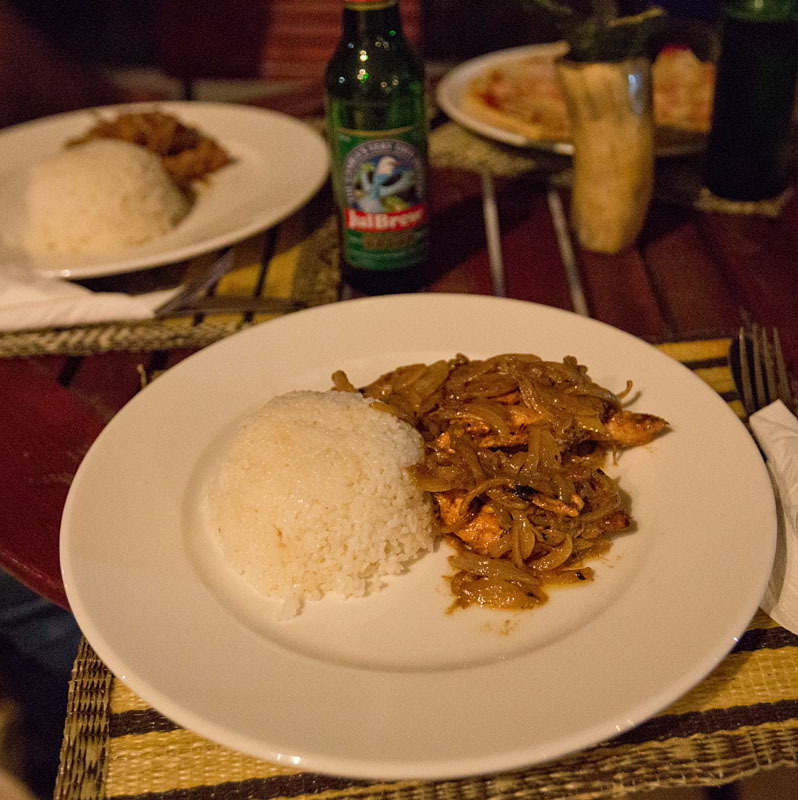 And at Jason & Jordan's hotel, the Gambia Coral Beach Hotel, where I had some Chicken Yassa for dinner. 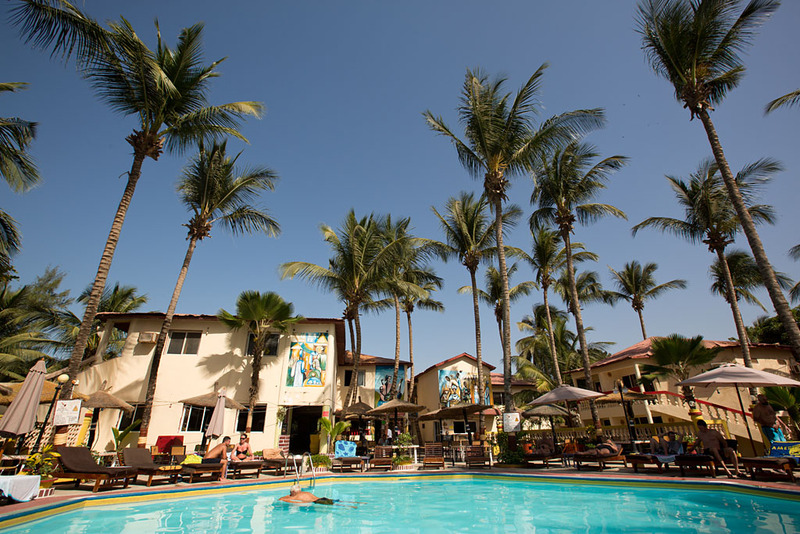 The Coral beach Hotel was $160-195 a night, so I booked an apartment just over the road instead for 50 euro's. 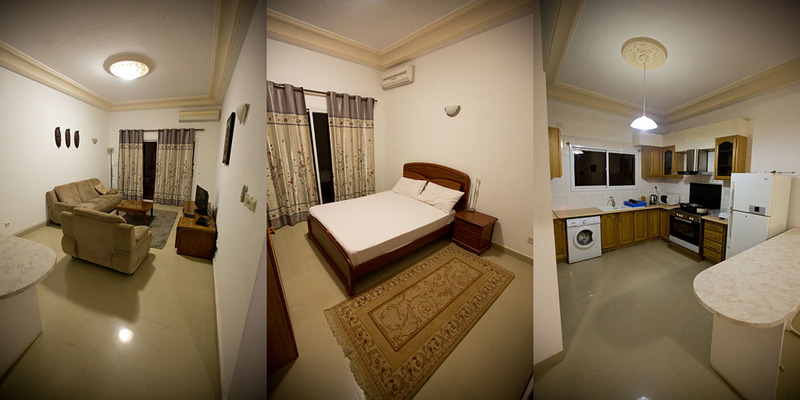 It was very spacious and perfect for the one night stay. 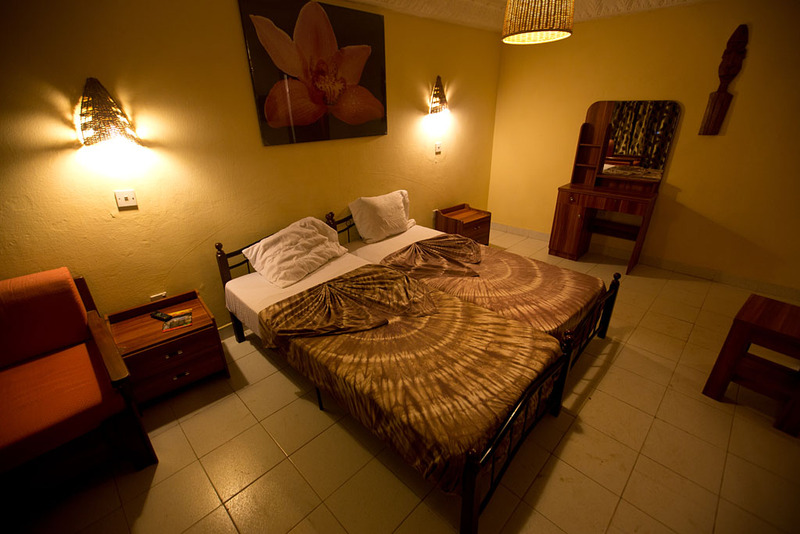 After a bit of hassle trying to get sheets for the bed organised, I then got a good night's rest before starting our road trip south tomorrow over the border into the Senegal and onto the city of Ziguinchor.